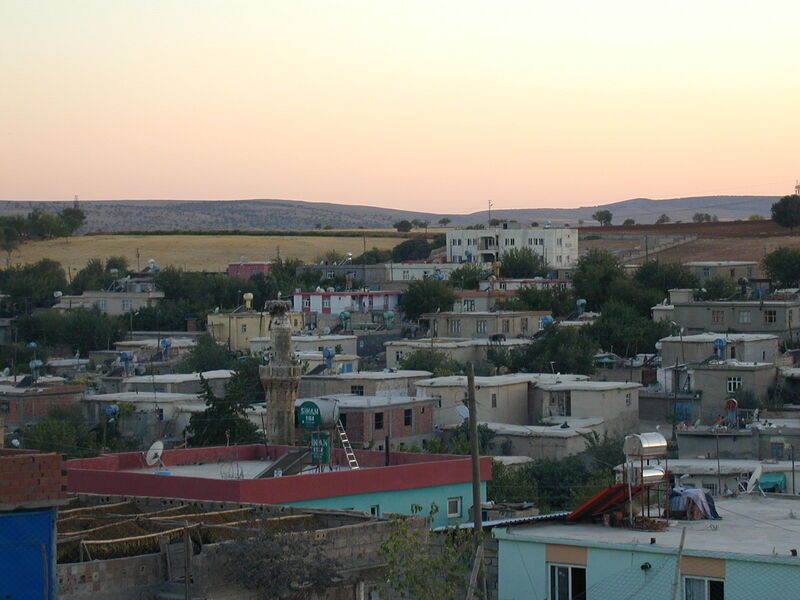 The demand for expropriation of the protection area where Sofraz Tumuli are situated and the updated projects of CNCDP are submitted to Şanlıurfa Cultural Heritage Conservation Regional Board. 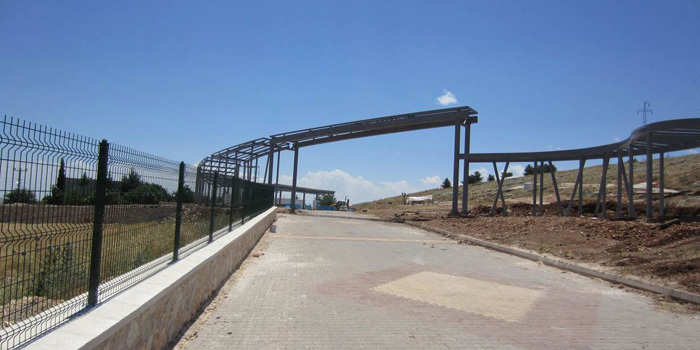 Construction site delivery is made for Yeni Kale restoration project of which the whole procurement procedure is supported by İpekyolu Development Agency. 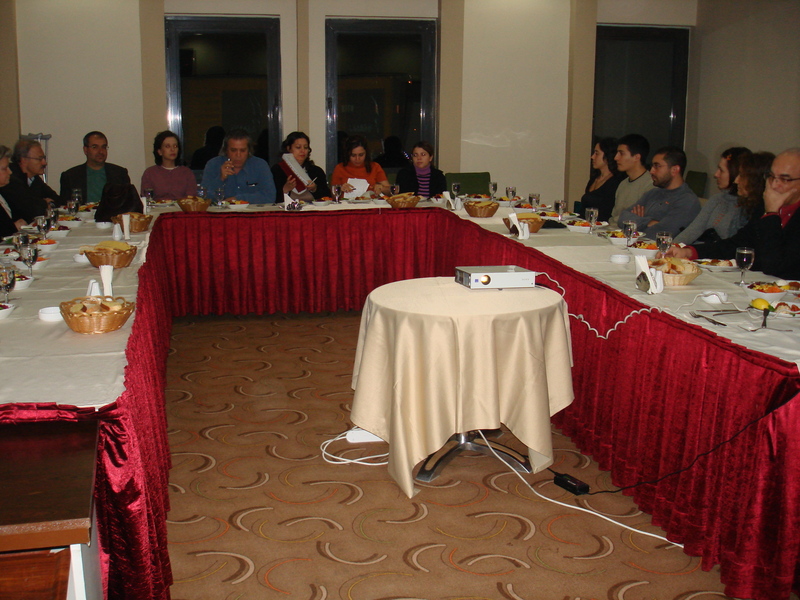 Commagene Nemrut Coordination and Supervision Board regular meeting 2014/2 was held in Adıyaman on December 23, 2014. 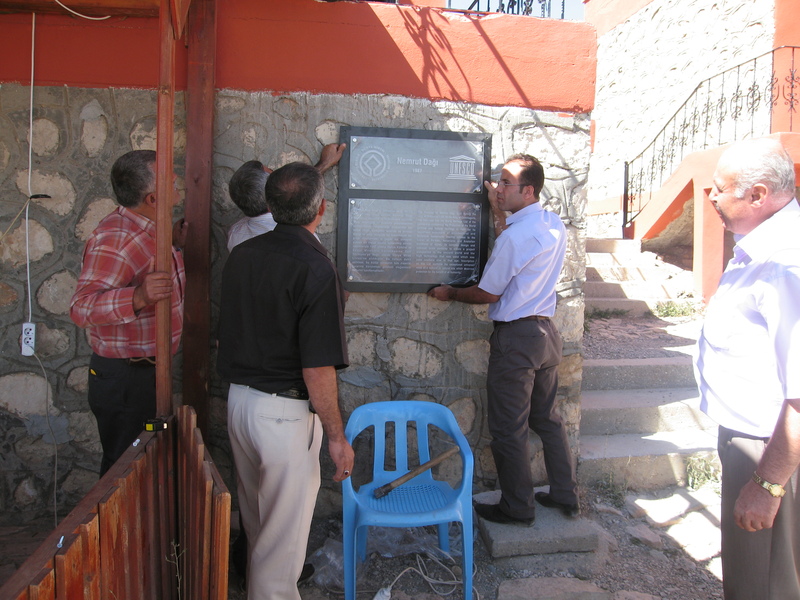 A support is obtained from the İpek Yolu Development Agency for the continuation of the restoration work which was already started by the Ministry of Culture and Tourism, and the restoration work was contracted by the Special Provincial Administration. 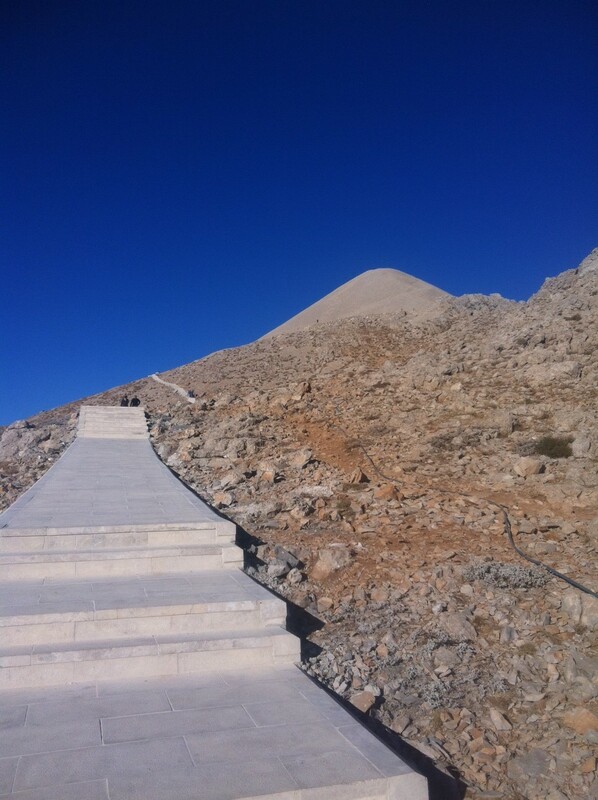 The Commagene Nemrut Management Plan, which was prepared according to the relevant legislations, was completed in 20/04/2014. 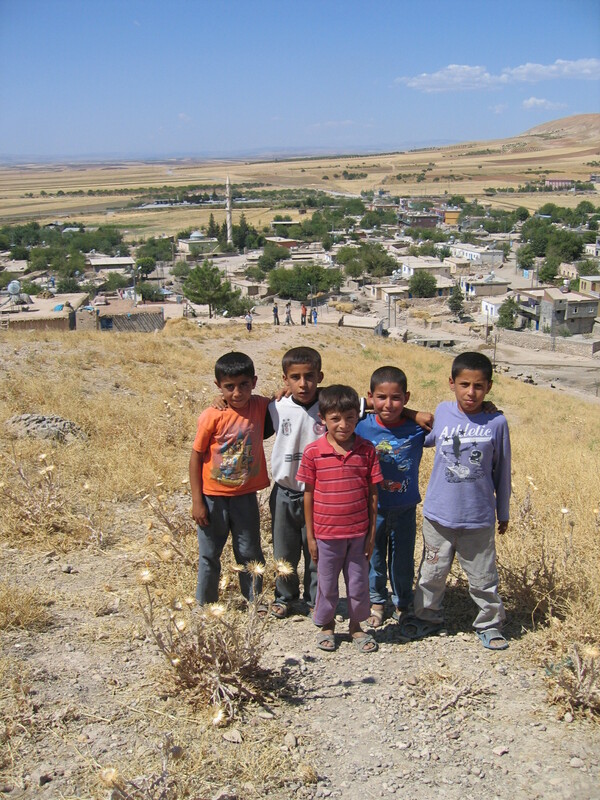 The plan was examined by the Commagene Nemrut Coordination and Supervision Agency in 12/09/2013 and was eventually approved on June 25, 2014 in the meeting (2014/1) held in Adıyaman. 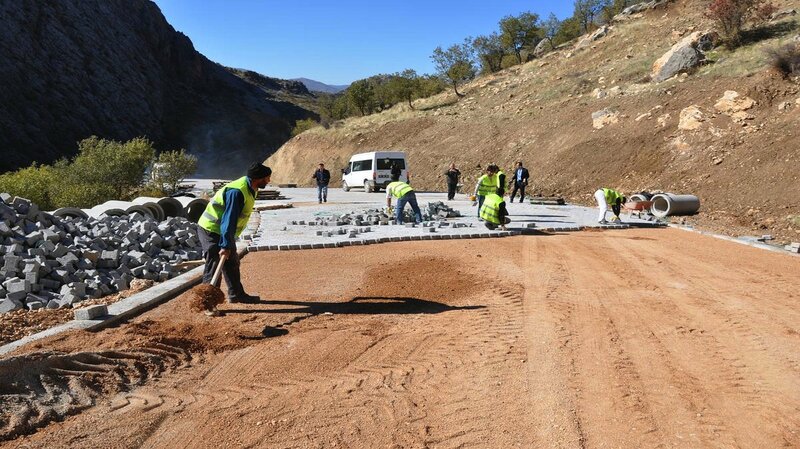 Within the framework of the Revitalization project of the tourism sector in Adıyaman (RTSA), all the land allocation procedure was completed except Sofraz Tumuli and Turuş Rock Cut Tombs. 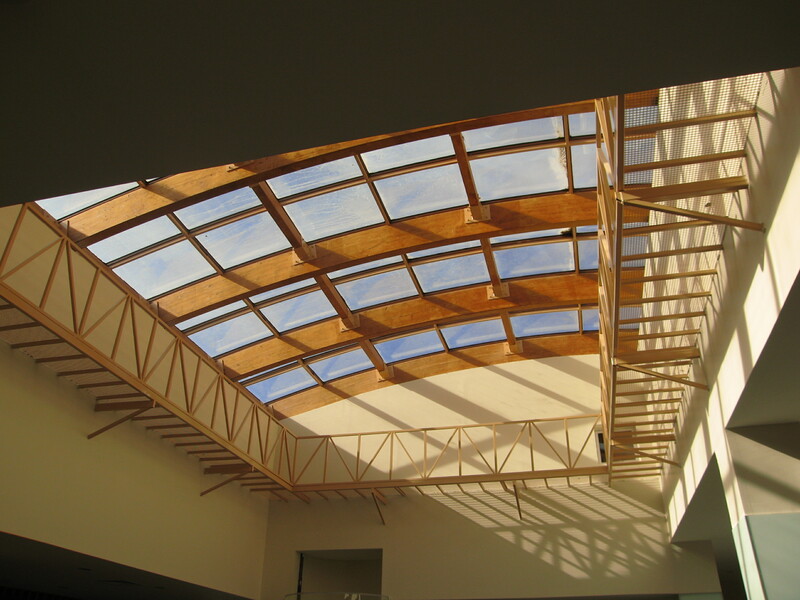 Thus was achieved compliance with program standards for the implementation of IPA-RCOP support of the project in question. 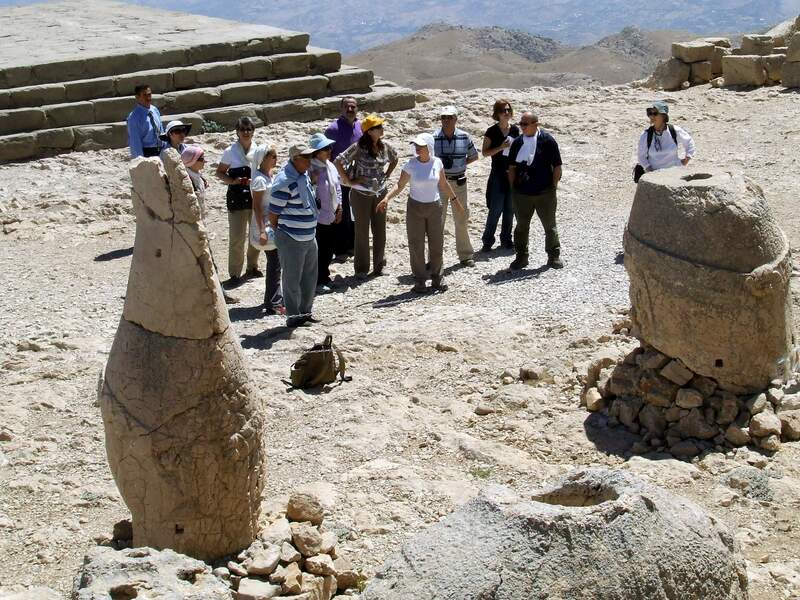 The latest UNESCO WHS meeting prepared by the Ministry of Culture and Tourism for the periodic reporting study for Nemrut, a World Heritage Site, was held in Adıyaman. 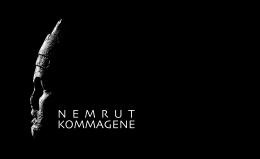 As a part of the ongoing work of CNDP in accordance with the relevant legislation, Commagene Nemrut Coordination and Supervisory Board was created by the Authority Approval (date 20.04.2014 and number 97829). 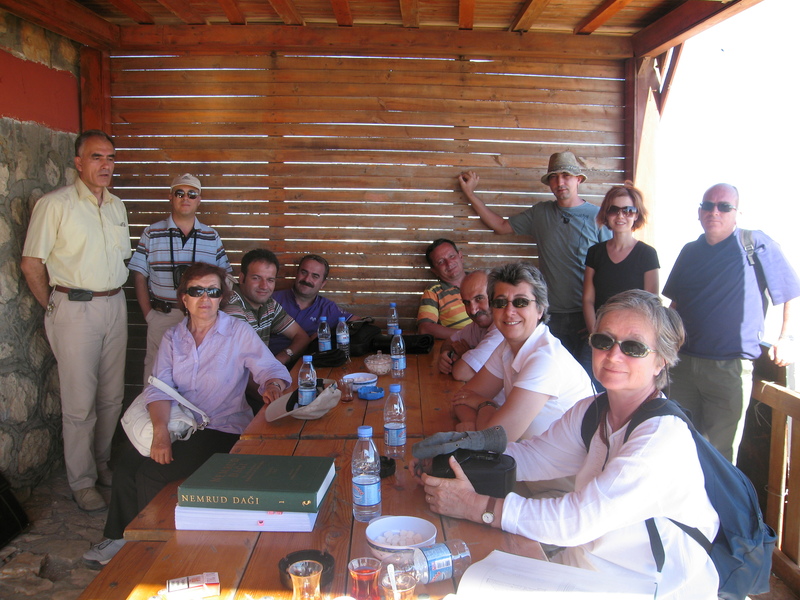 Commagene Nemrut Advisory Committee which was created in 09/12/2013. 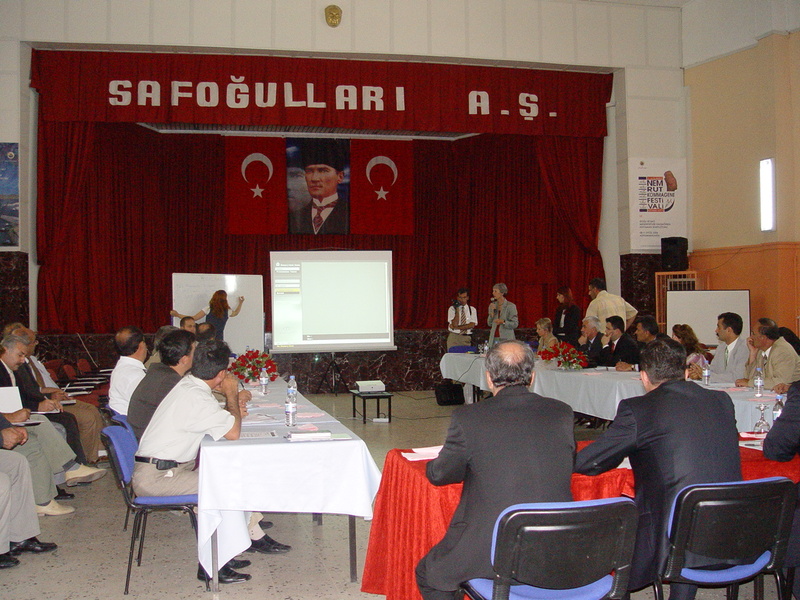 The plan was eventually approved in the meeting (2014/1) held in 29 April 2014 in Adıyaman. 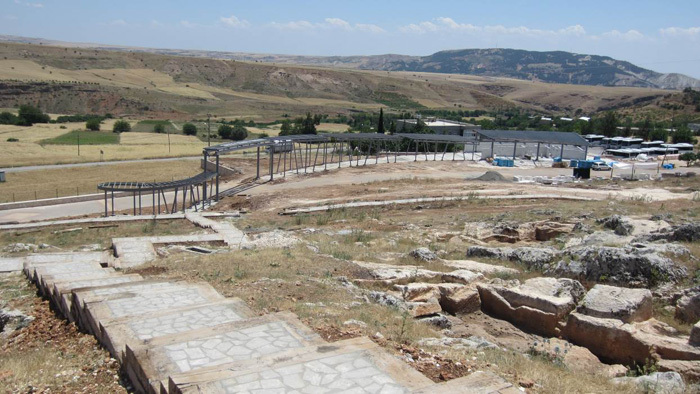 The preliminary project for the Revitalization of the tourism sector in Adıyaman (RTSA), which was foreseen to be implemented under the IPA-RCOP support, were approved in principle by the Sanliurfa Regional Board of Conservation of Cultural Heritage. 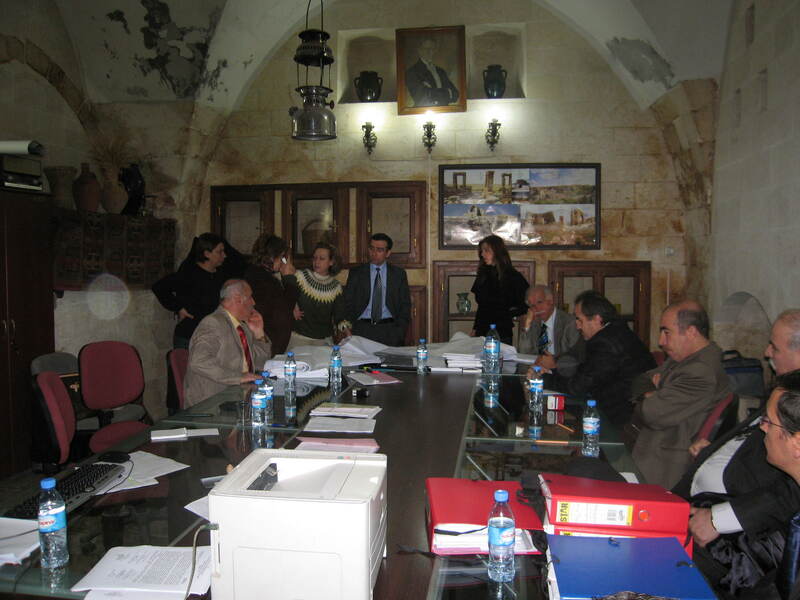 The preliminary project for the Revitalization of the tourism sector in Adıyaman(RTSA), planned to be realized under the IPA-RCOP support was sent to the Ministry of Culture and Tourism to be forwarded to the Sanliurfa Regional Board of Cultural Heritage Conservation. EU Delegation has approved the Operational Identification Sheet (OIS) for the Revitalization Project of Tourism Industry in Adıyaman (RTSA). 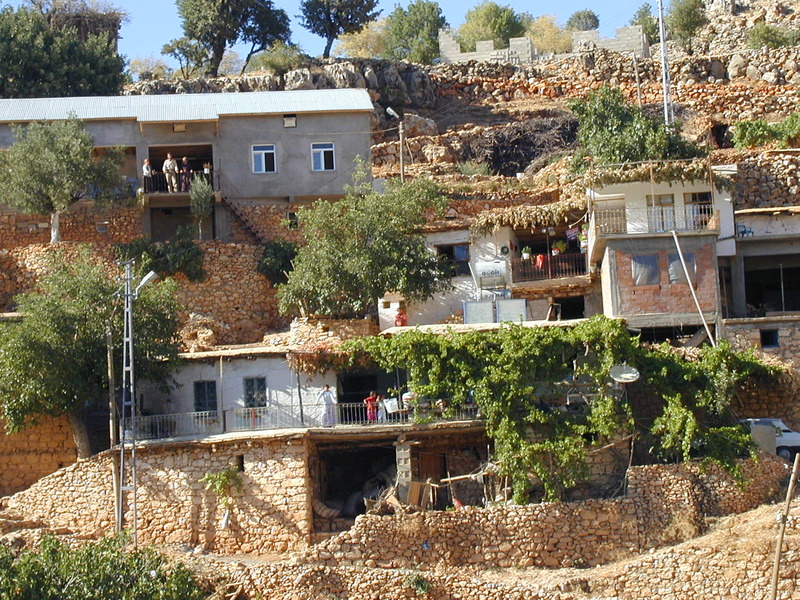 The preliminary project for the Revitalization of the tourism sector in Adıyaman(RTSA), found acceptable in principle by the General Directorate of Nature Protection and National Parks. The local studies and their results regarding the Revitalization of the tourism sector in Adıyaman were presented to the officials of EU Delegation and the Ministry of Science, Industry and Technology, verbal consent was obtained. 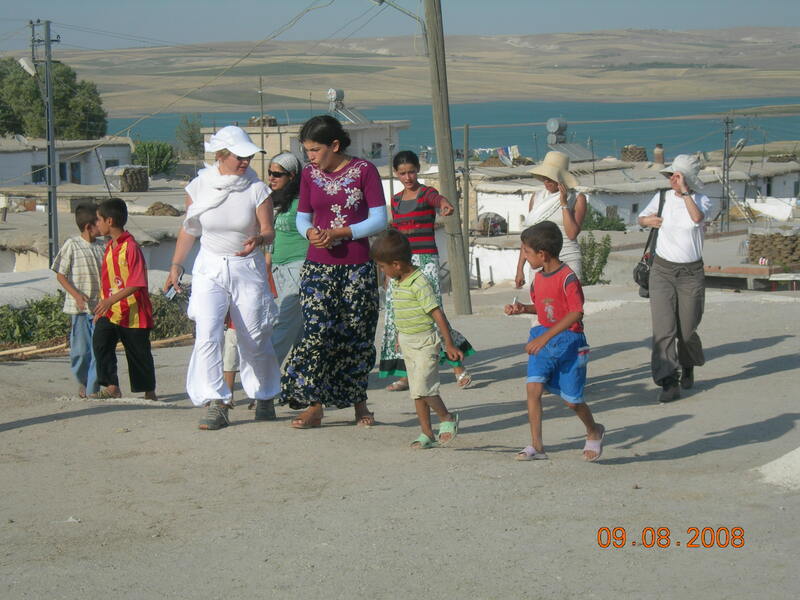 Concerning the projects which take place within the scope of the Tourism Sector Revitalization Project in Adıyaman , the Site Management Unit has made an allocation demand to the relevant government agencies. 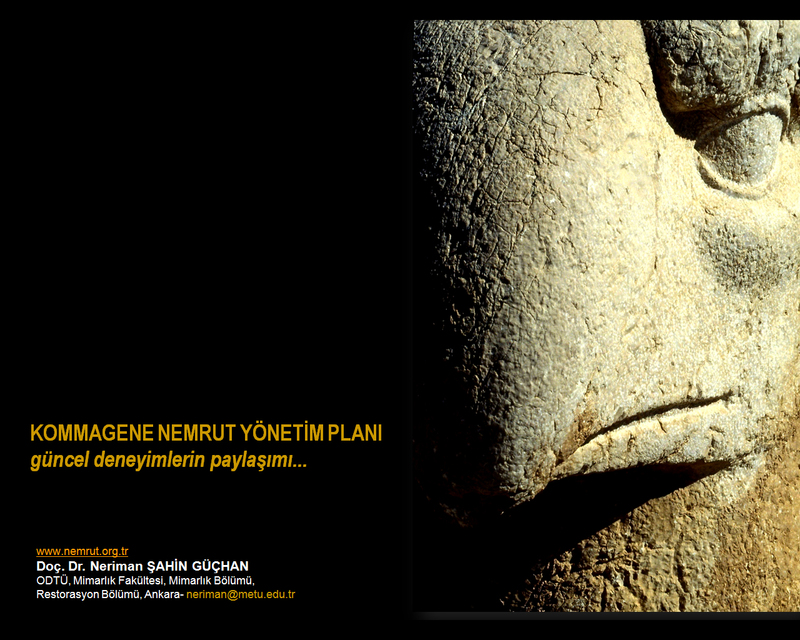 The completed Commagene Nemrut Management Plan (CNMP) and the site boundaries approved by the Ministry of Culture and Tourism were officially transmitted to the relevant authorities and stakeholders for their suggestions and approval. The last revisions were made accordingly. 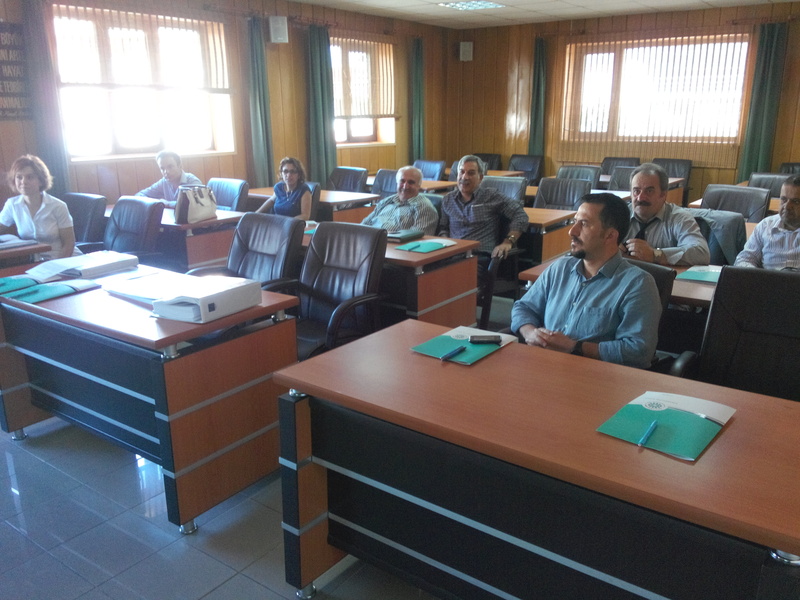 The Site Management Unit provided participation in the training for creating implementation capacity provided by the officials from the Ministry of Science, Industry and Technology for the projects which will take place within the Tourism Sector Revitalization Project in Adıyaman. As a part of the CNMP studies ongoing in accordance with relevant legislation, the Commagene Nemrut Advisory Board was created with the authority consent number 177636 date 12.09.2013. 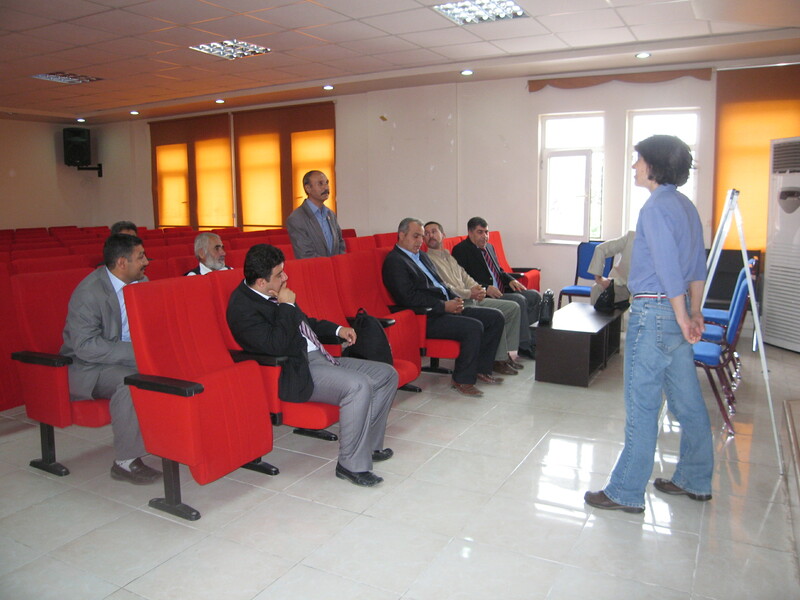 A Project Training Unit (A-PTU) was established by the approval of Adıyaman Governorate to work with the Project Management Unit. 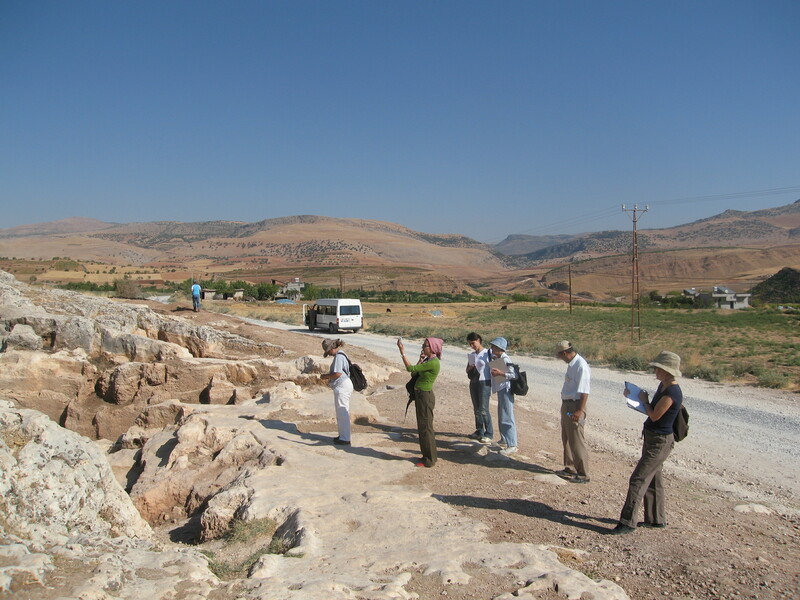 The project updates and cost estimates of the Environmental Design Projects within the scope of Tourism Sector Revitalization Project in Adıyaman were explained to the EU Delegation and the officials of the Ministry of Science, Industry and Technology, and the negotiations continued. 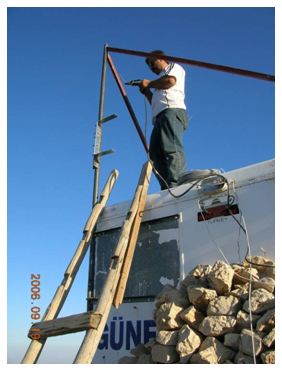 As part of the ongoing work of CNMP in accordance with the relevant legislation, Onur Yıldız was assigned as Commagene Nemrut Site Manager with the authority consent with the date 28.06.2013 and number 127175. After the approvals by the relevant public institutions between the dates 26 October 2011 – 7 September 2012, The CNMP boundaries, including the protection sites and connection points situated within the CNMP area, were submitted to the approval of the Ministry of Culture and Tourism and were approved by the decision dated June 7, 2013, and number 111 983. 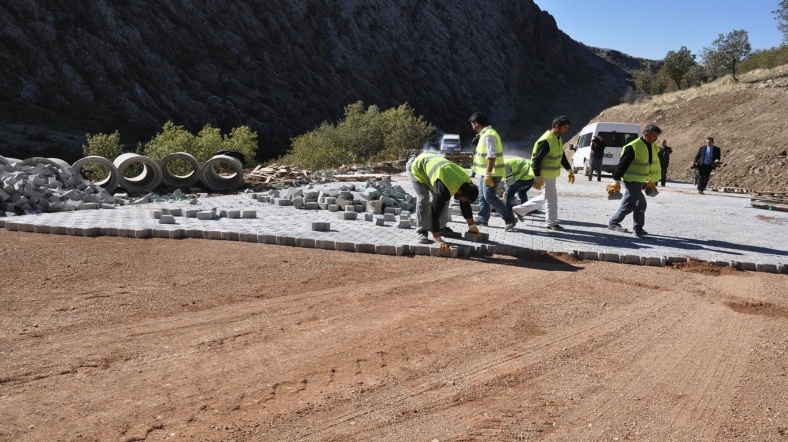 Mount Nemrut King Road Project Construction work was contracted by the Adıyaman provincial Administration. 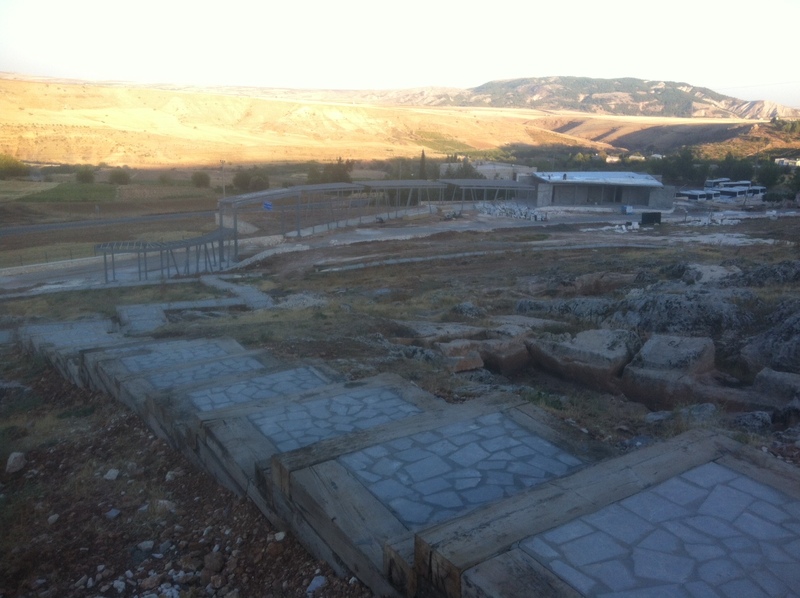 The authority of appointing the site manager was given to the Ministry of Culture and Tourism by the Adıyaman Municipal Council Decision in order to ensure that the protection sites situated in Adıyaman Center should be dealt together with other sites. 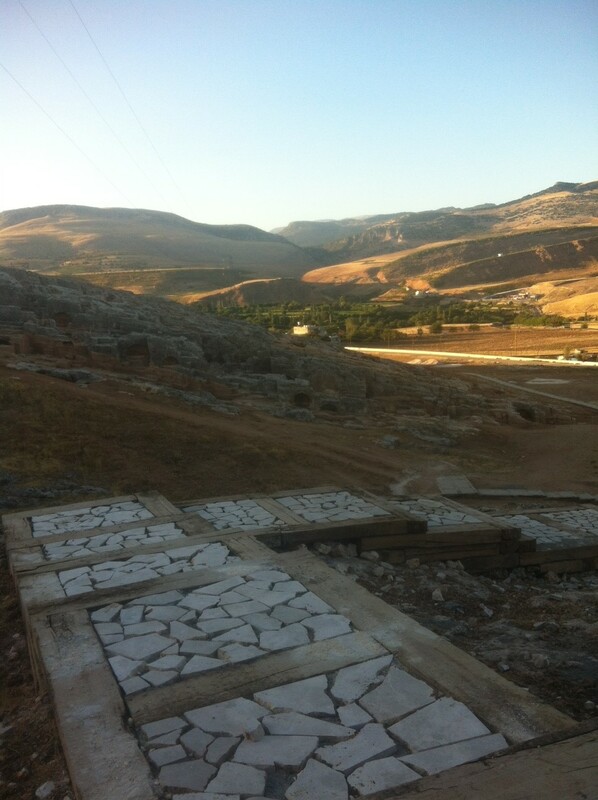 The Environmental Design Construction work for the ancient city of Perre was contracted by the Adıyaman Provincial Administration. 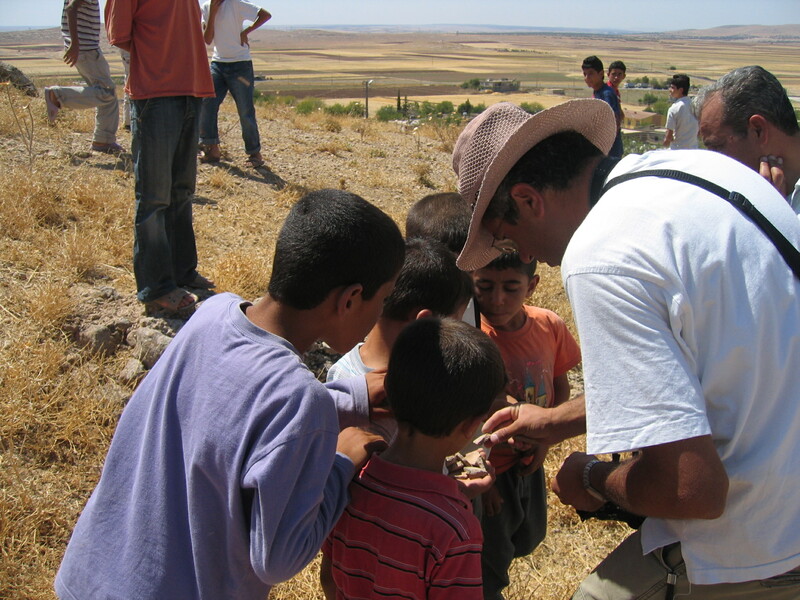 Commagene Nemrut Conservation Development Program coordinator Assoc. Dr. N. Sahin Güçhan and assistant coordinator Dr. G. Bilgin Altınöz, attended the meeting in Leuven, Belgium at the invitation of the University of Leuven. 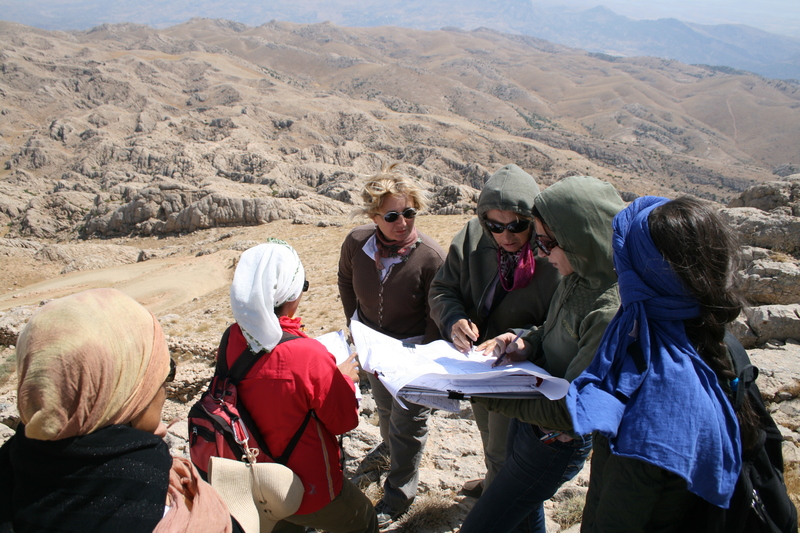 In the meeting, the Commagene Nemrut Management Plan experience is shared, and suggestions for Sagallassos are discusse with the Sagalassos excavation team. 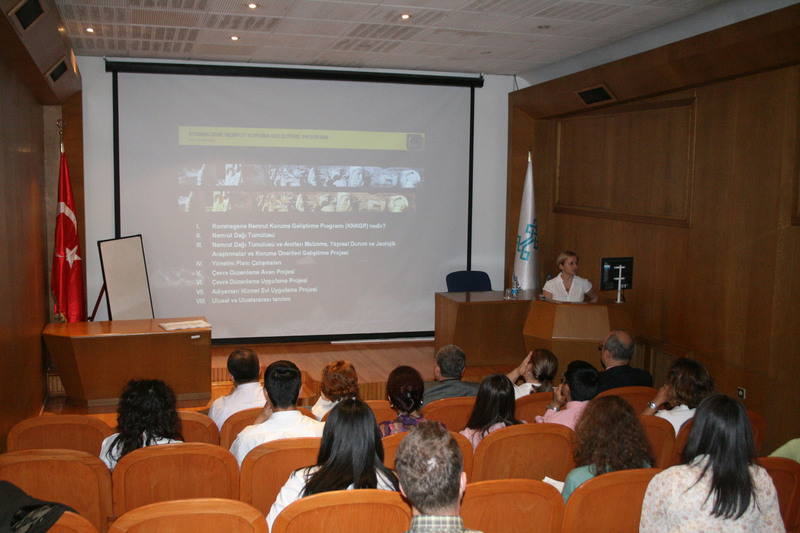 A presentation was made for the EU Delegation and the Ministry of Science, IPA- EU Financial Programs Department officials from the Ministry of Industry and Technology concerning the Revitalization Project of Adıyaman Tourism Sector. 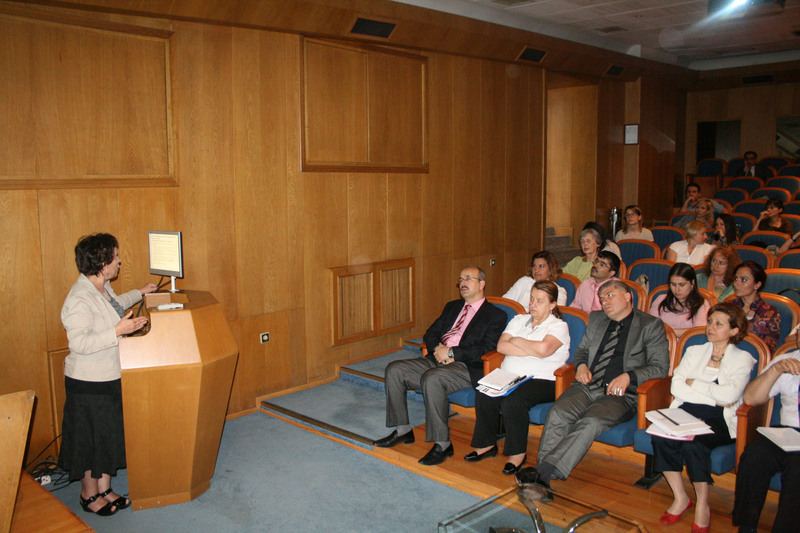 A Project evaluation meeting was held with the Ministry officials, regarding the Revitalization Project of Adıyaman Tourism Sector, which was entitled to support under the Regional Competitiveness Operational Program (RCOP), carried out by the IPA- EU Financial Programs Department of the Ministry of Science, Industry and Technology, with a total value of 6,896,831 Euros. 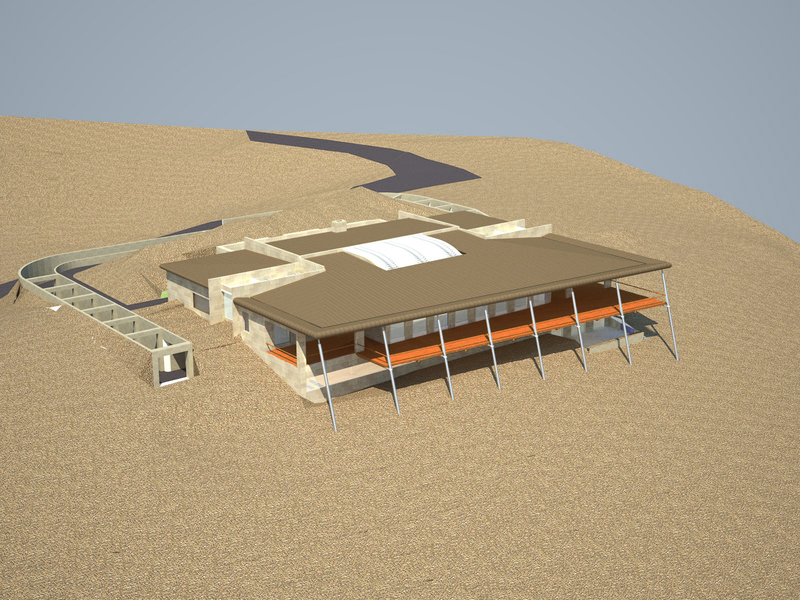 Adıyaman Governorate approval was taken for the establishment of the Site Unit. 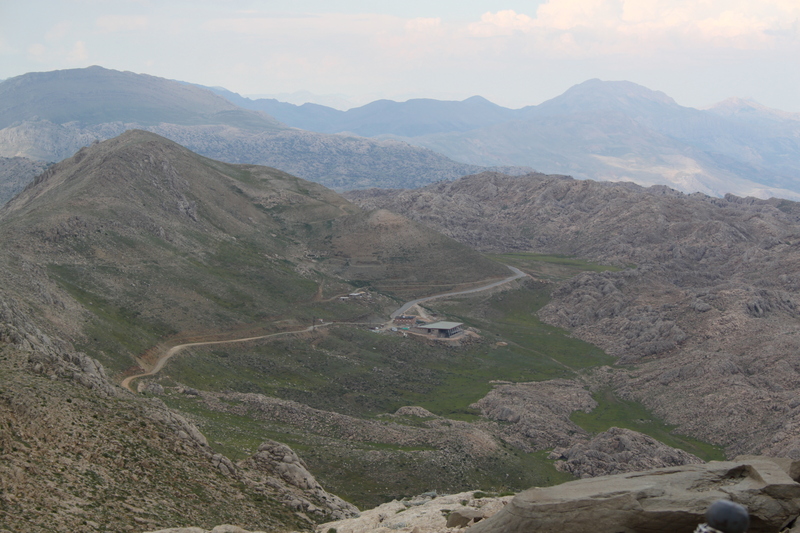 Substantial completion was awarded for the Mount Nemrut Power Line Construction Work supported by the İpekyolu Development Agency. 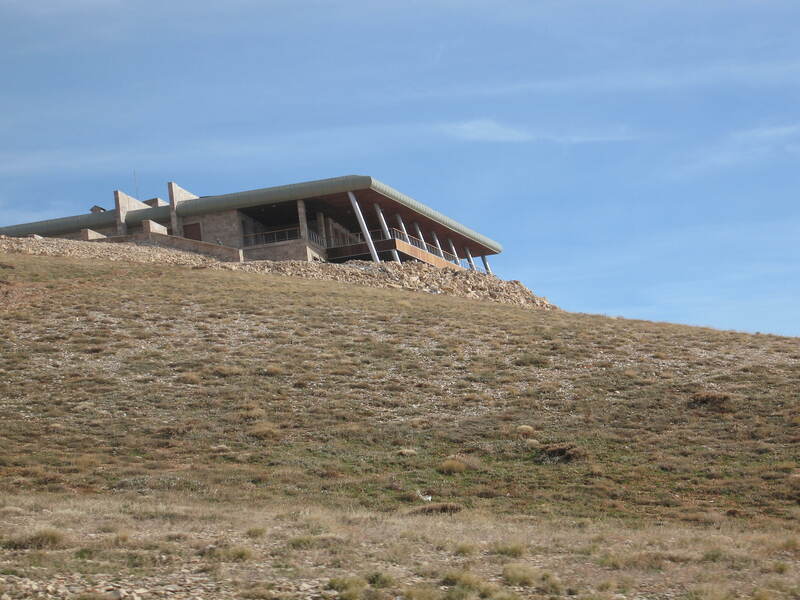 The substantial completion was given for the construction work of the “Mount Nemrut Tumulus Adıyaman Visitor Center” tendered out by the Ministry of Culture and Tourism. 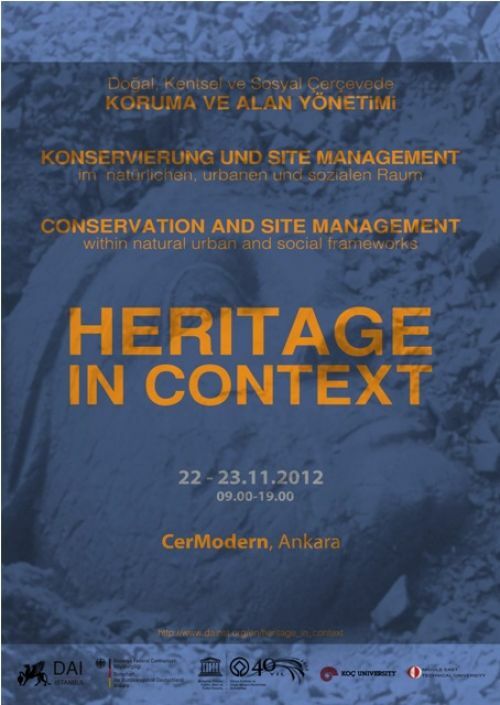 An International Symposium, entitled “”Heritage in Context” – Conservation and Site Management within Natural, Urban and Social Frameworks” organized jointly by Istanbul German Archaeological Institute, the German Embassy, Koç University and METU was held in Cermodern Museum in Ankara, in November 22-23, 2012. 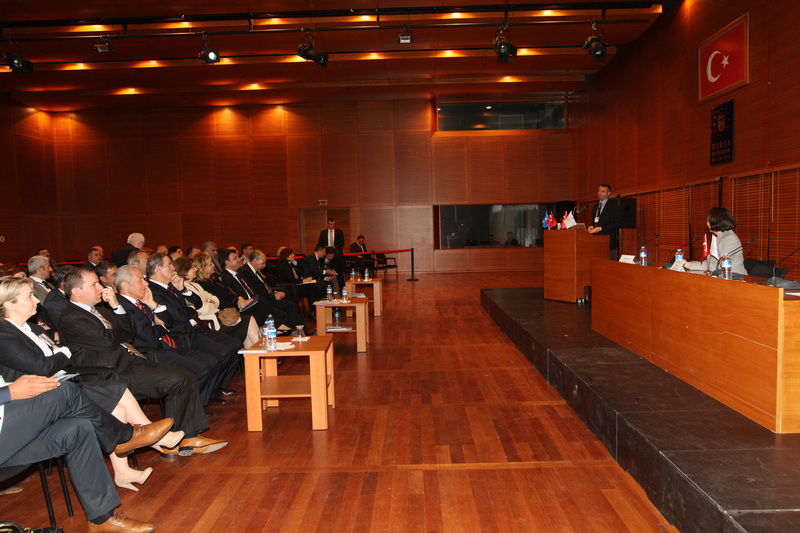 At the conference, various examples from Turkey and abroad were presented and discussed by national and international experts . Assoc. 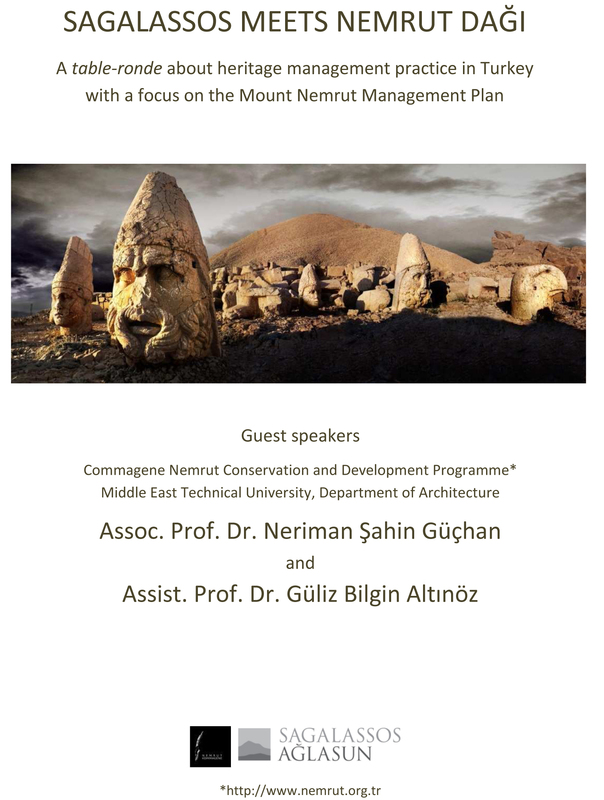 Prof. Dr. Neriman Şahin Güçhan made a presentation at the meeting concerning the Commagene Nemrut Management Plan which has come to an end titled: “Conservation of relationship between “place” and “context”: Commagene Nemrut Conservation Development Program”. In the meeting, Assoc. Prof. Dr. Neriman Şahin Güçhan has made a presentation entitled: “Conservation of relationship between “place” and “context”: Commagene Nemrut Conservation Development Program”. Assoc. 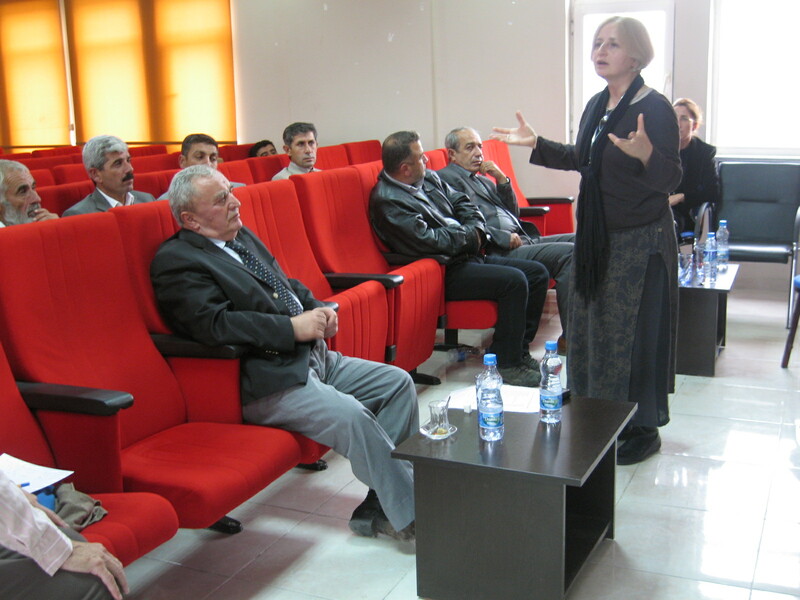 Prof. Dr. Neriman Şahin Güçhan and Asst. 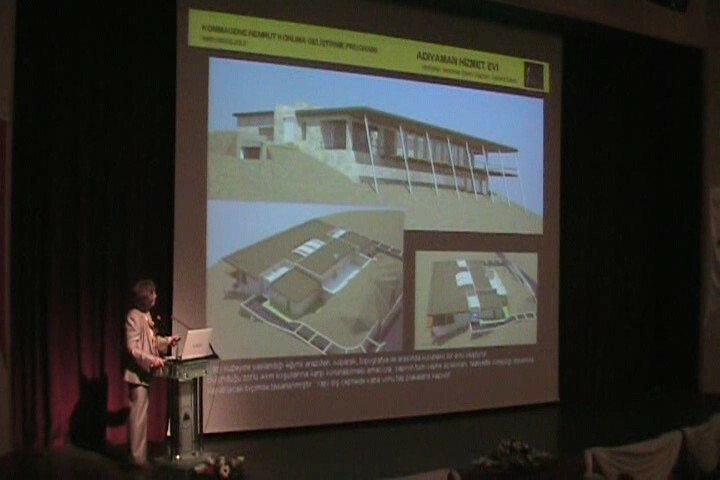 Prof. Dr. Nida Naycı made a presentation titled “Conservation-Planning Procedures/Tools, “meaning, context and integrity” of Cultural Assets in Turkey” during the “2nd Conservation Symposium of Projects and Implementations Aimed at Conservation of Cultural Assets” which is organized jointly by Mersin University Restoration and Conservation Center and the Ministry of Culture and Tourism. The site boundaries of CNMP marked on 1/1000 scale Map, the annex of the Management Plan, are approved by the Şanlıurfa Regional Protection Board after various surveys and evaluations made at the site. 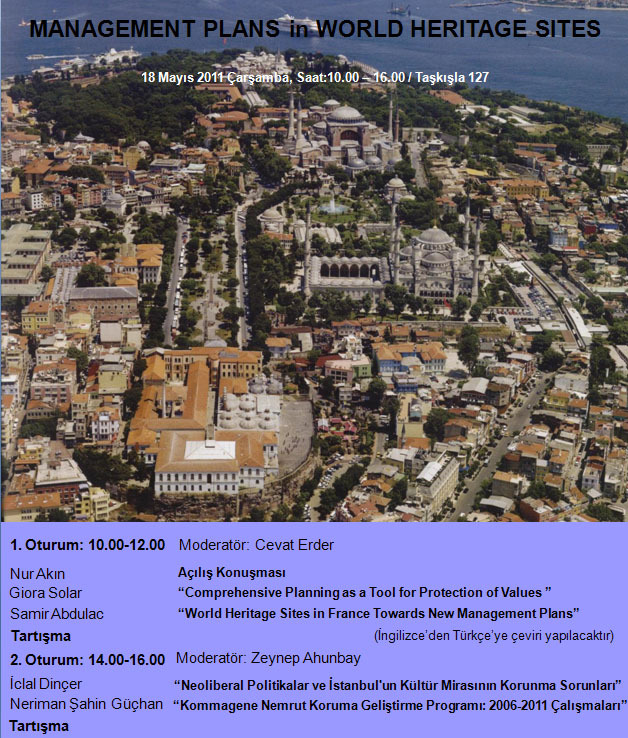 Within the framework of the UNESCO World Heritage Convention 40th anniversary celebrations held in Turkey, the World Heritage Area Management Plan Preparation Experience Sharing Workshop was held at the Atatürk Congress and Culture Center in Bursa in 25-26 May 2012. 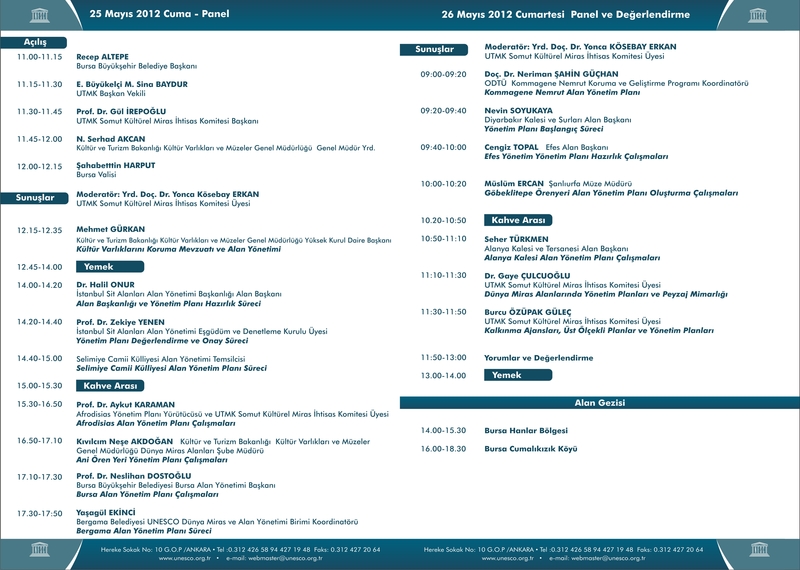 METU CNCDP Coordinator Assoc. 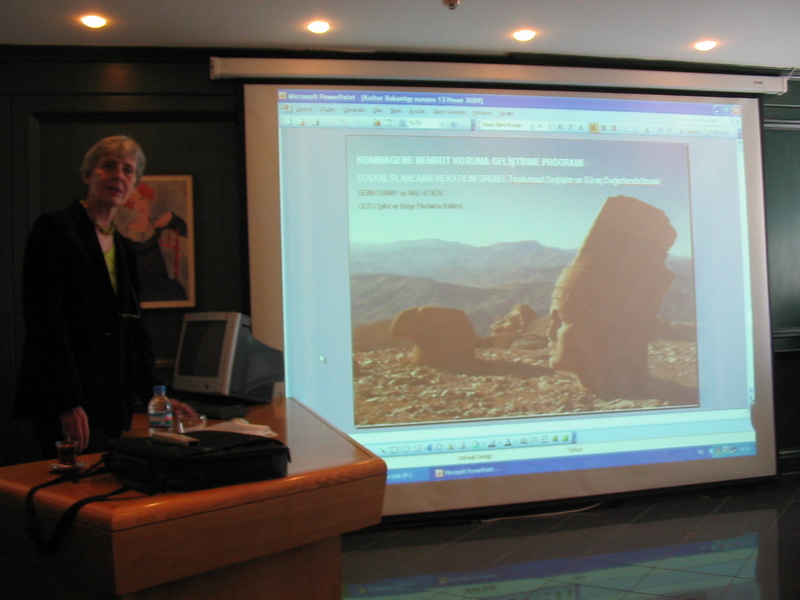 Dr. Neriman Şahin GÜÇHAN made a presentation about the completed Commagene Nemrut Management Plan. 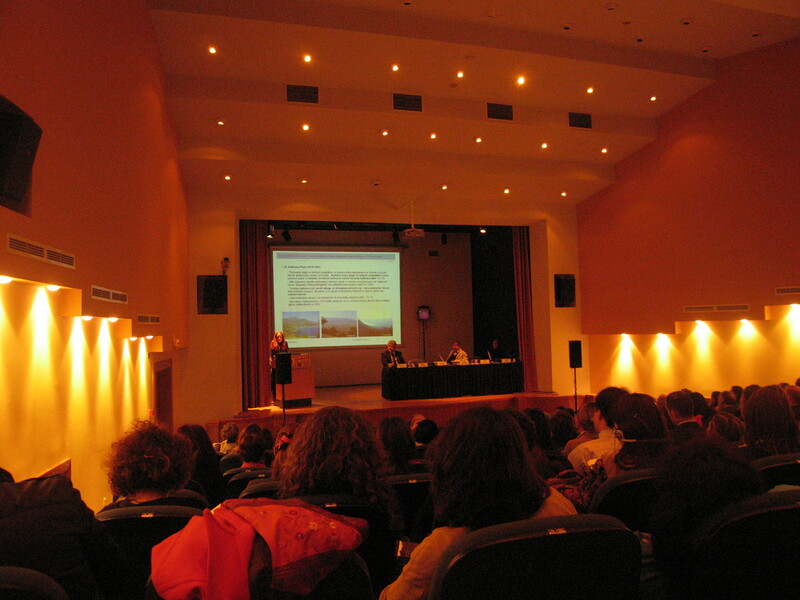 Koç University RCAC-INFO In a daily meeting held in the Conference Hall of Koç University RCAC in Istanbul, Assoc. Dr Neriman Şahin Güçhan shared the CNDP experience by making a presentation titled “protection of place and context of the relationship: Commagene Nemrut Conservation and Development Program”. 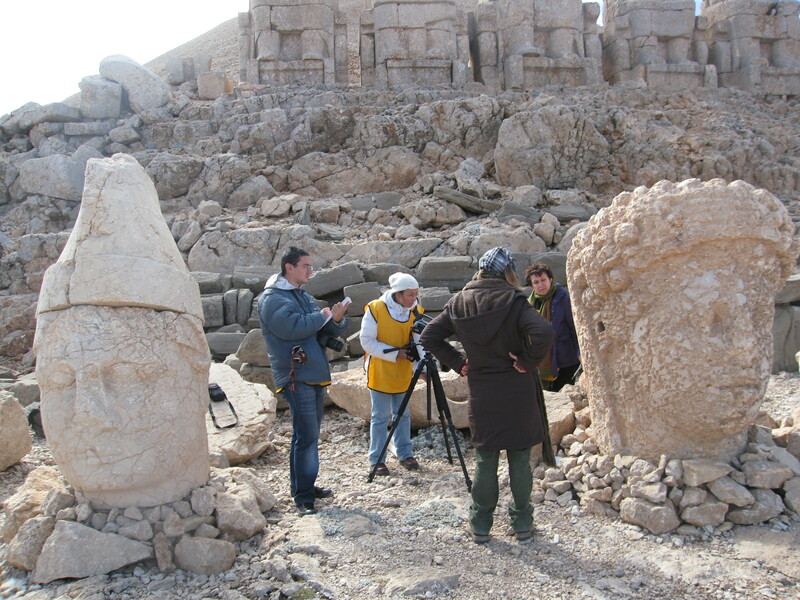 Mount Nemrut Tumulus Survey, Restitution and Restoration Projects approved in October 2011 by Şanlıurfa Regional Protection Border has been sent to the Ministry of Foreign Affairs for submission to the World Heritage Centre. 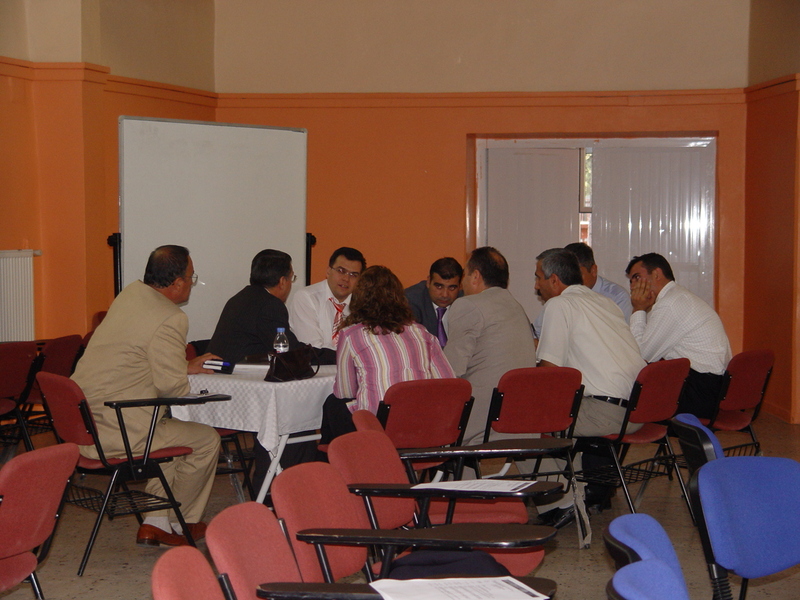 Later, in accordance with ICOMOS opinion the necessary evaluation and updates were made in the projects. 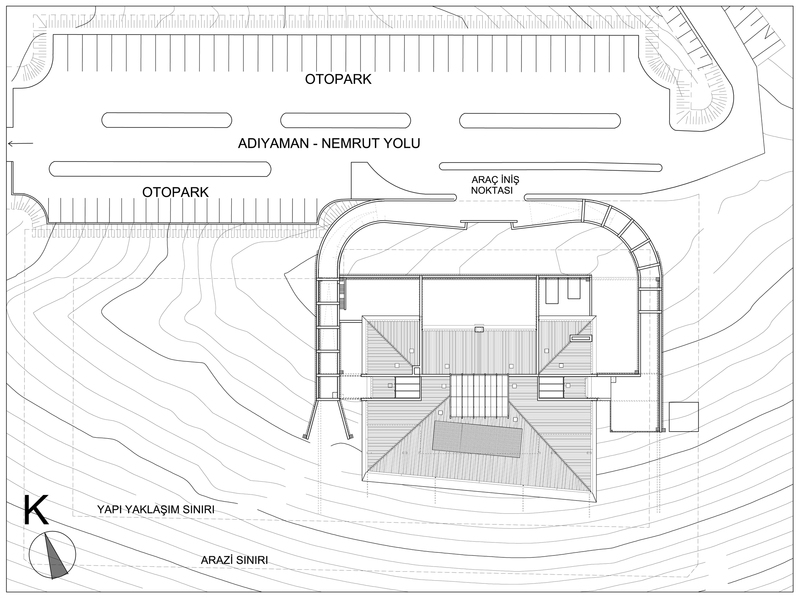 Following the completion of the tender for the construction of Visitor Houses at the Malatya and Adıyaman sides of Mount Nemrut Tumulus, the construction phase started. 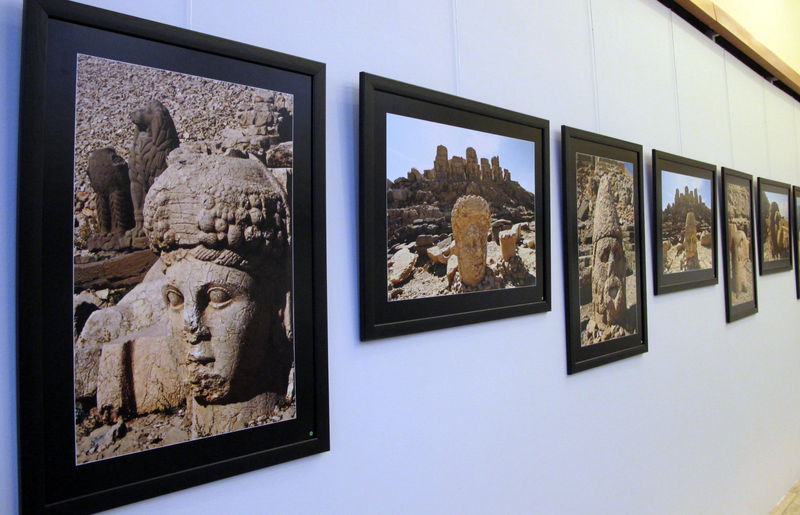 Hasan Saltik’s photography exhibition ‘Civilisation of Commagene Nemrut’ is held at Atılım University, Faculty of Fine Arts. 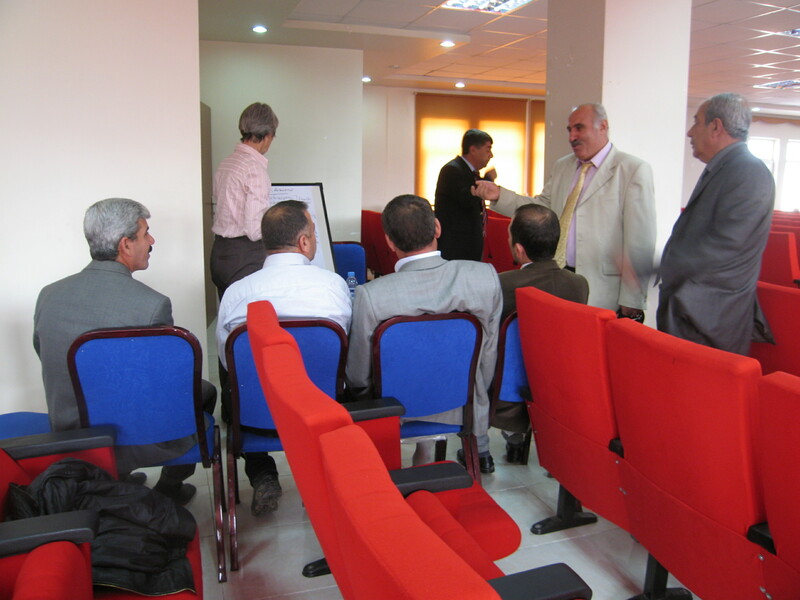 Conservation Council meeting held in Şanlıurfa, in which the measured drawings, reconstitution and conservation projects are discussed and all the projects are approved by the Council. 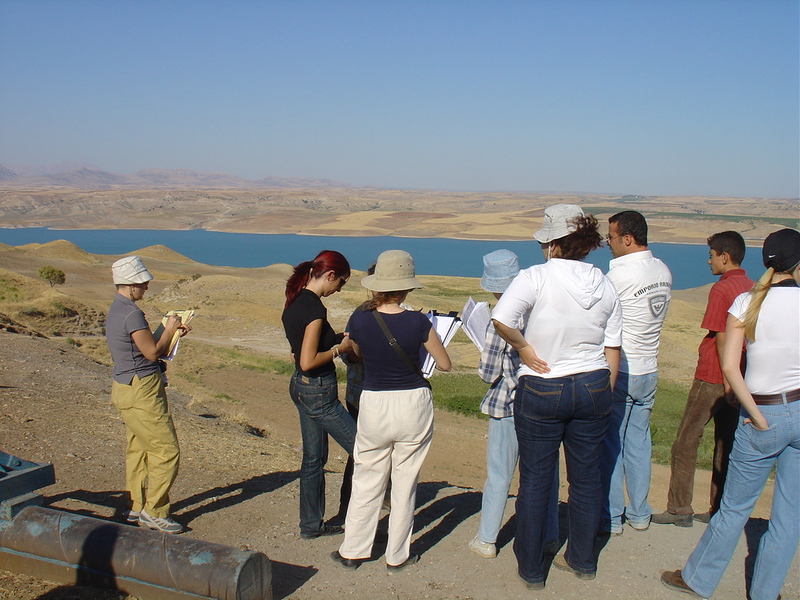 The final revisions of the protection area borders of the 14 villages or assets which take place within the borders of Commagene Nemrut Management Area are marked on the 1/1000 scaled maps and submitted for the approval of the Sanliurfa Cultural and Natural Assets Protection Border. CNCD Program Manager Assoc. 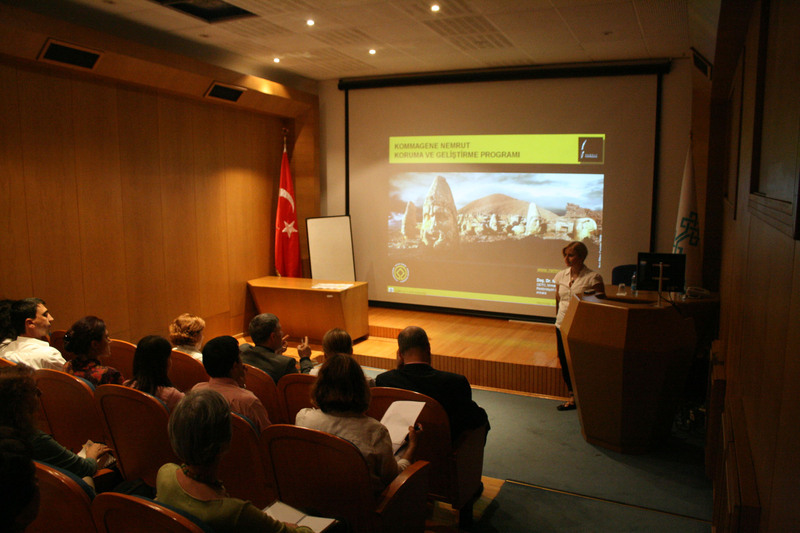 Prof. Dr. Neriman Şahin Güçhan gave the lecture titled: ‘Conservation of a World Heritage Site in Turkey: Mount Nemrut Tumulus’ in the International Rome-Tor Vergata University’s international Summer School of ‘Conservation of Historical Buildings, Monuments and Historical Sites’. Program Manager Assoc. 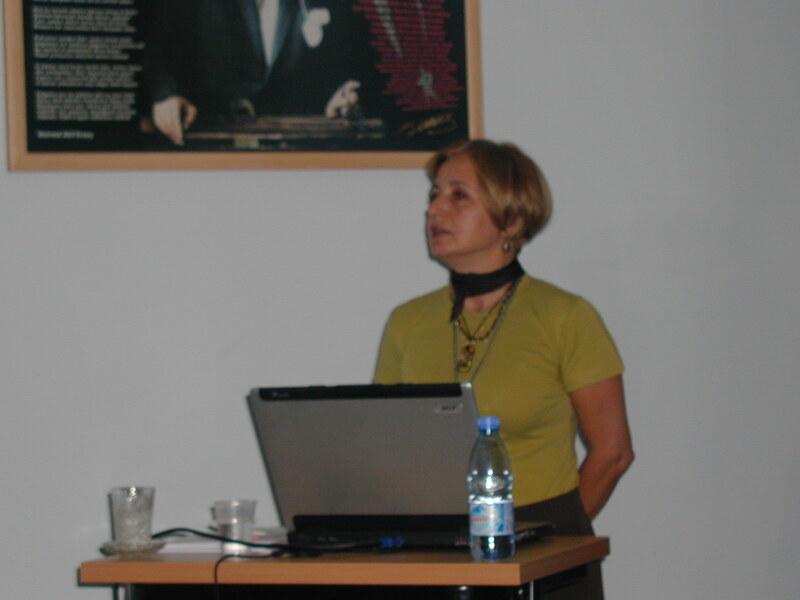 Prof. Dr. Neriman Şahin Güçhan presented the paper titled: “Mount Nemrut Tumulus: Conserving the Integrity of ‘Place’ and ‘Context’ at the symposium: ‘The 4th International Conference on Hazards and Modern Heritage: The Importance of Place.” held in Sarajevo. Program Manager Assoc. 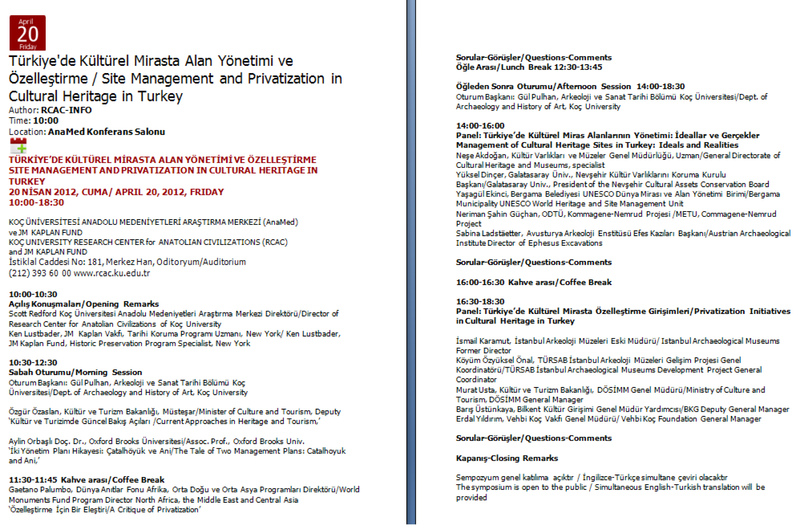 Prof. Dr. Neriman Şahin Güçhan was invited to the national symposium organized by the Chamber of Landscape Architects to make a presentation about the CNCDP. The Program Manager Assoc. 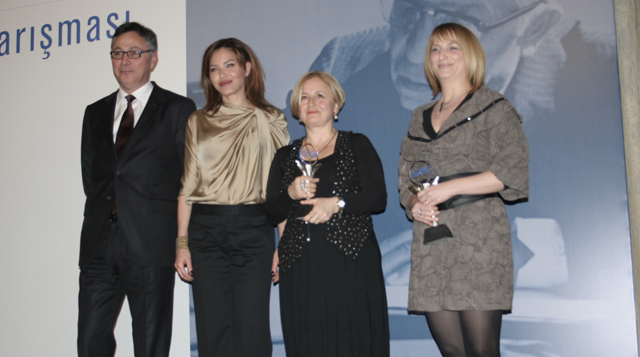 Prof. Dr. Neriman Şahin Güçhan and the asst. program coordinator Asst. Prof.Dr. A. Güliz Bilgin Altınöz have won the Mehmet Kemal Dedeman Special Incentive Award shared with another project in the ‘Special Research and Development Project Contest 2010’ with the project titled: ‘A model for determination of a cultural tourism focused destination and management: Commagene Nemrut’. 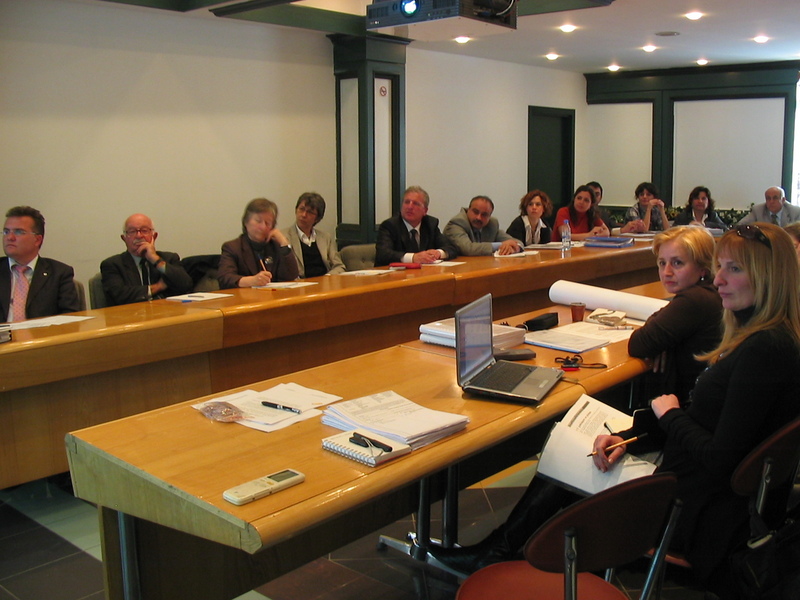 The Scientific Advisory Committee is presented the actual stage of the project at the meeting held at the General Directory of Cultural Assets and Museums. The project team has made presentations on the evolution of the different branches of the project, the conservation proposals, the management plan and material research result analyses. 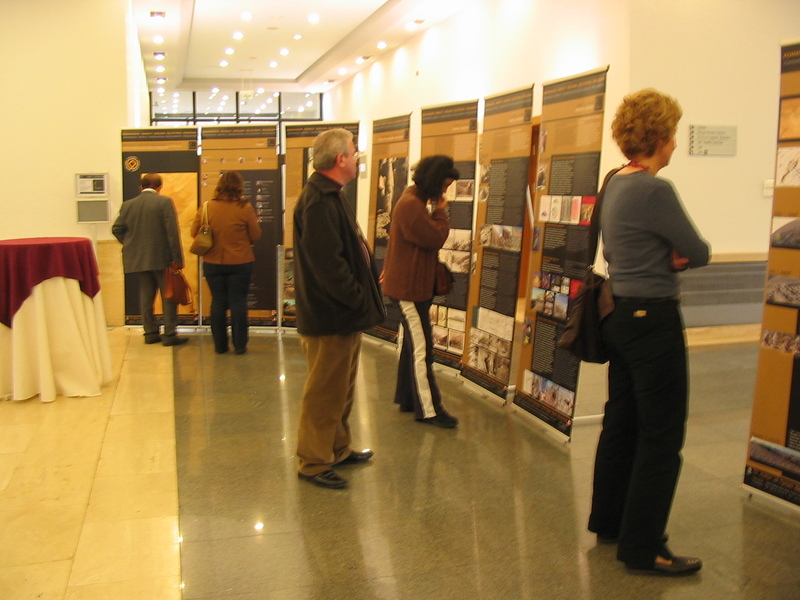 The final project result documents are submitted to the Ministry of Culture and Tourism. 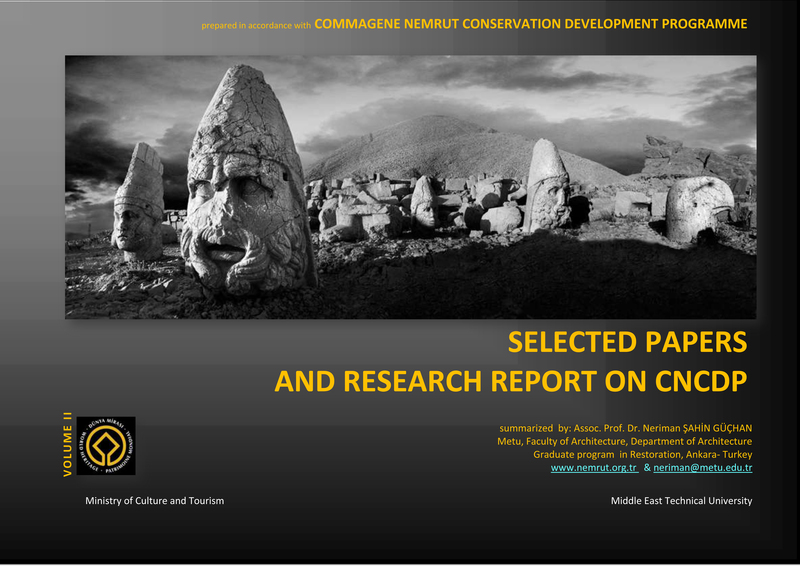 As an outcome of the Commagene Nemrut Management Plan studies: the reports on the definition of the different projects to be realized, and the final decisions, the Definition of Monitoring, Evaluation and Training Procedures; As an outcome of the conservation studies: the Conservation Project and its report; and the final report of the Material Researches which define the proposed conservation and consolidation techniques. Hasan Saltık’s photography exhibition ‘Commagenian Civilisation’ is set to run between 13th to 20th December at the Middle East Technical University Congress Center Exhibition Hall. 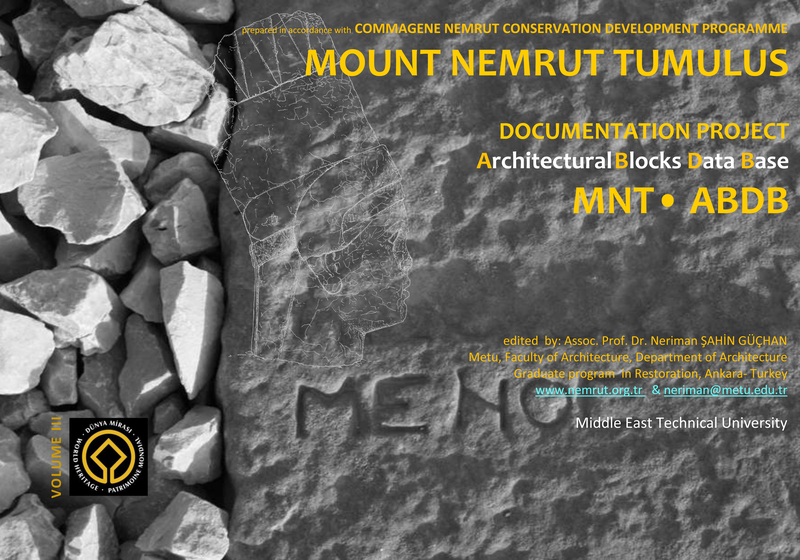 A presentation about the Mount Nemrut Tumulus Management Plan is made by CNCD Program Manager Assoc. 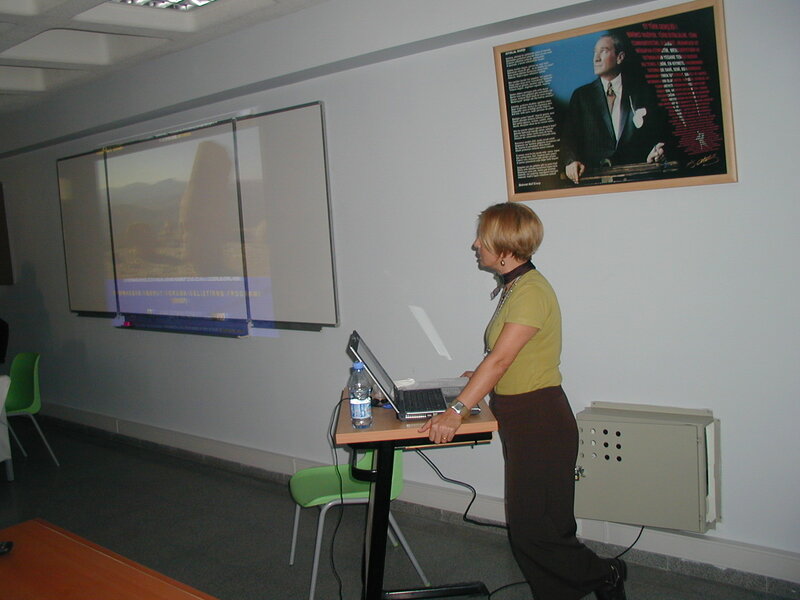 Prof. Dr. Neriman Şahin Güçhan at the Department of Archaeology and History of Art, Koç University. 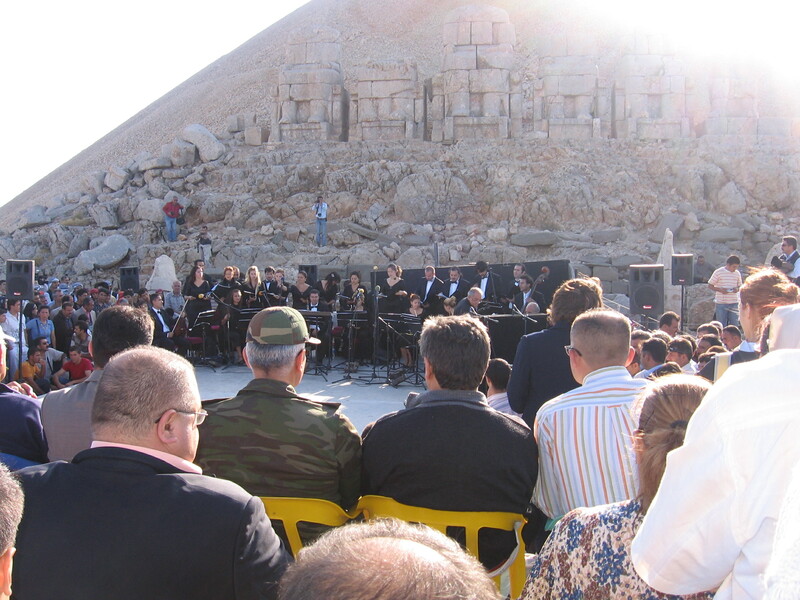 The Reconstitution Project and report including all previous work and interventions at Mount Nemrut Tumulus are submitted to the Ministry of Culture and Tourism. At the meeting the Committee is presented the Measured Drawings and the Restitution Projects for review. In addition to this, various points concerning the conservation approach are discussed and the management plan borders and the future projects are presented. 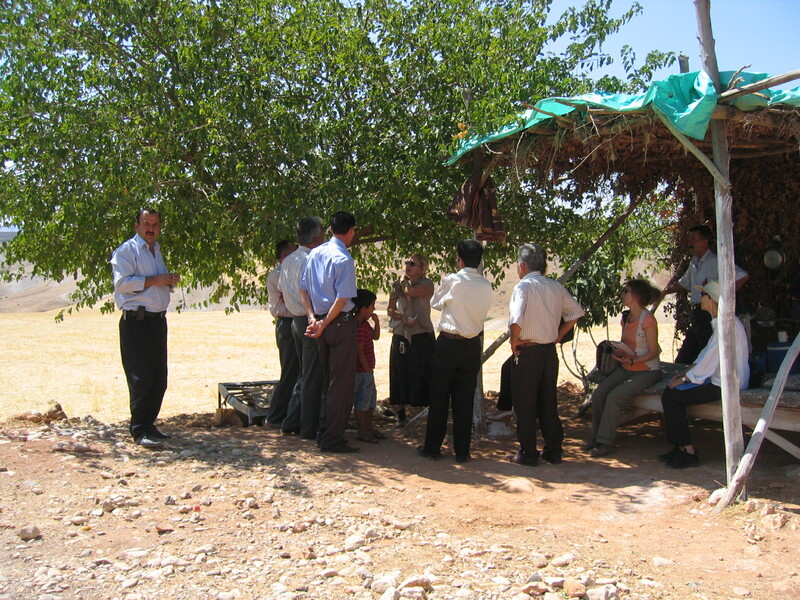 In addition to the stakeholders meetings held in 2006, 2008 and 2009, the last meeting was held in Adiyaman. In this meeting, the visions and proposals of the stakeholders are discussed, the priorities are determined, the future tasks for the preservation of the management plan areas and the commitments, contributions and participation of the local actors are determined. 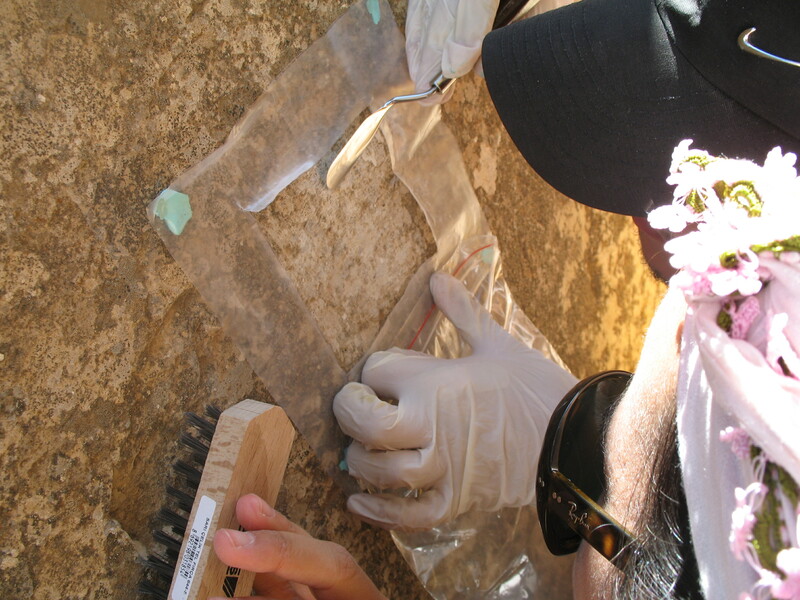 The material conservation team carried out a field work concentrated on the protective textile casings for the stone head blocks in the area and other material analyses on samples. 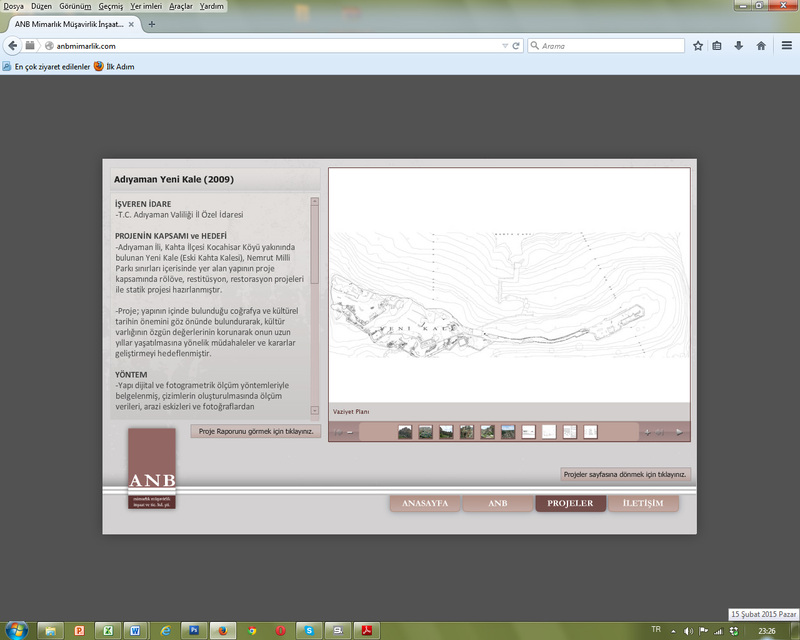 The second team worked on updating the measured drawings and finalized the field survey results. 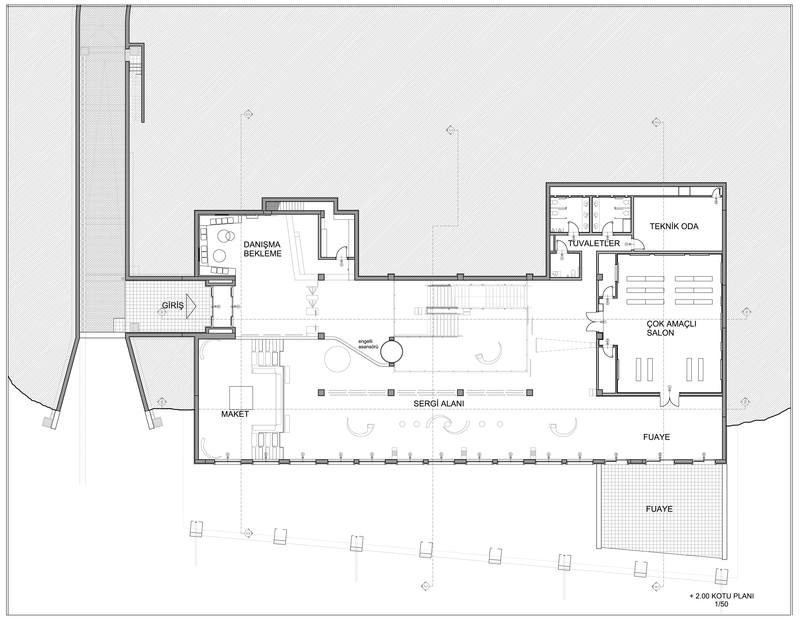 The Measured Drawings Project composed of 39 drawing sheets showing the actual state of the area, the deterioration definitions and mappings showing the different deterioration types on 54 stone blocks, the Measured Drawings Report and the Material Research Interim Report are submitted to the Ministry of Culture and Tourism. CNCDP Manager Assoc. Prof. Dr. Neriman Şahin Güçhan and the other coordinators of the different projects of CNPDP made presentations about the latest stage of the projects. 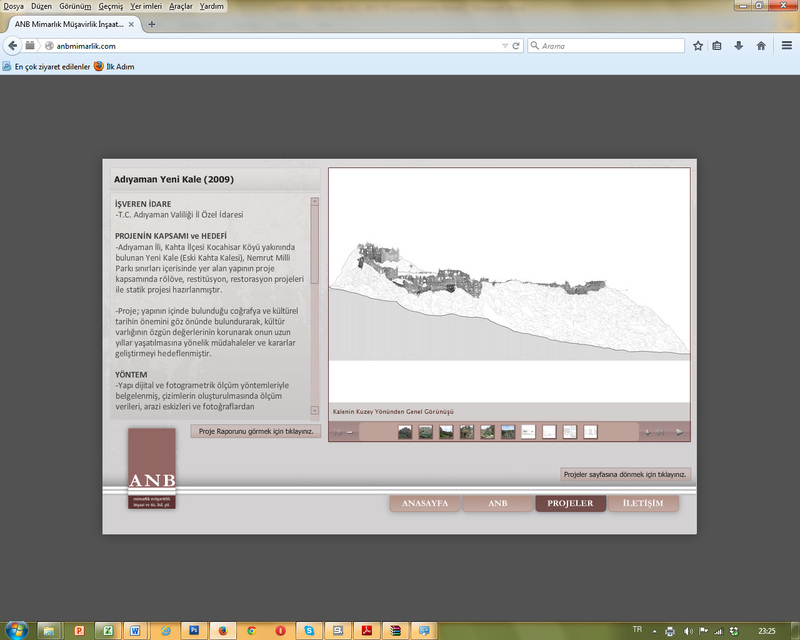 The inventory sheets (prepared in Geographical Information System) of all the cultural and natural assets and the settlements in the district boundaries of Adıyaman which were determined as a result of the METU-CNPDP studies ongoing since 2006 and a list of assets to be included in the list of protection were submitted to the Ministry together with the material conservation research interim report. A meeting was held at the Ministry of Culture and Tourism about the preservation of Perre rock cut tombs, procurement of its environmental design projects and the ways to incorporate the area within the Commagene Nemrut Management Plan. Sadet Sayın, architect, author of the Visitor Center Projects made a presentation about the buildings and the Program Coordinator Assoc. Prof. Dr. Neriman Şahin Güçhan made a general presentation about the Commagene Nemrut Conservation and Development Program at the locality of 1927 Architects Association. CNCDP Coordinator Assoc. Prof. Dr. Neriman Şahin Güçhan and CNCDP Structural Investigation Coordinator Assoc. Prof. Dr. Ahmet Türer took part in the program ‘Living Cultural Heritage’, prepared by Füsun Nevbahar Ersoy and aired live every Sunday at 13:00, on Kanal B and gave information about the project. 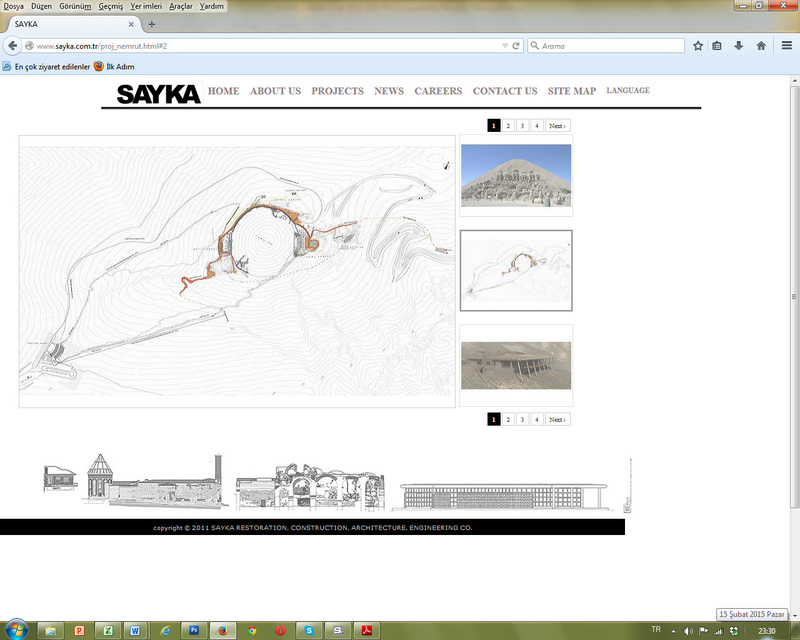 Tumulus of Mt Nemrut Environmental Design and Visitor Centre Projects were approved by the Şanlıurfa Cultural and Natural Assets Conservation Council’s decision 30.12.2009 / 1001. CNCDP Coordinator Assoc. 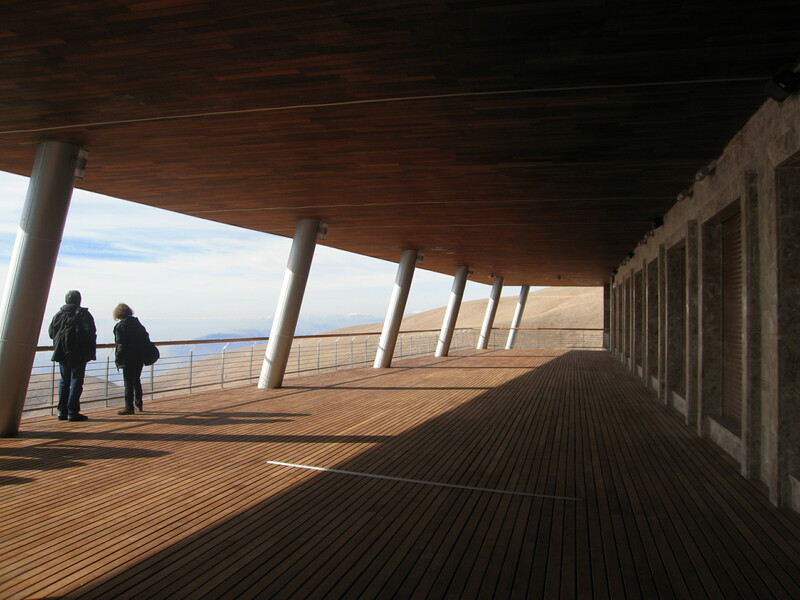 Prof. Dr. Neriman Şahin Güçhan and project author of Environmental Design and Visitor Centre Projects Saadet Sayın briefed Okkaş Dağlıoğlu, General Director of Cultural Assets and Museums. 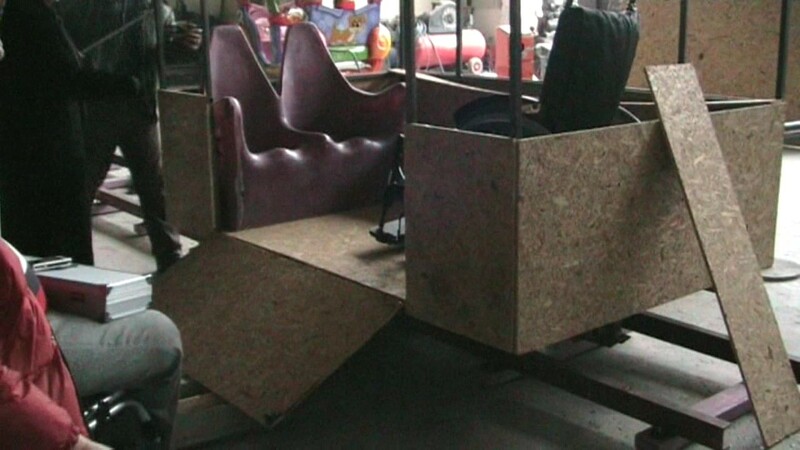 A real-size prototype was prepared for a disabled vehicle that will provide enhanced access to the tumulus for disabled visitors. A seminar on construction tenders was attended within the scope of ‘Commagene-Nemrut Tourism-Based Revitalization Project (KN-TOC)’. Meetings with authorities from the Ministry of Industry and Trade continue; the final project definition will be made in due course, followed by the tender process. CNCDP Coordinator Assoc. Prof. Dr. Neriman Şahin Güçhan made a presentation titled ‘Methodology of the Management Plan Preparation within the Commagene Nemrut Conservation Development Programme’ during the workshop that took place between 4-9 December 2009 in Kars and Ankara with the participation of related professionals and site managers. CNCDP Coordinator Assoc. Prof. Dr. Neriman Şahin Güçhan was interviewed by Nüket Kantarcı from Ankara Life Magazine. 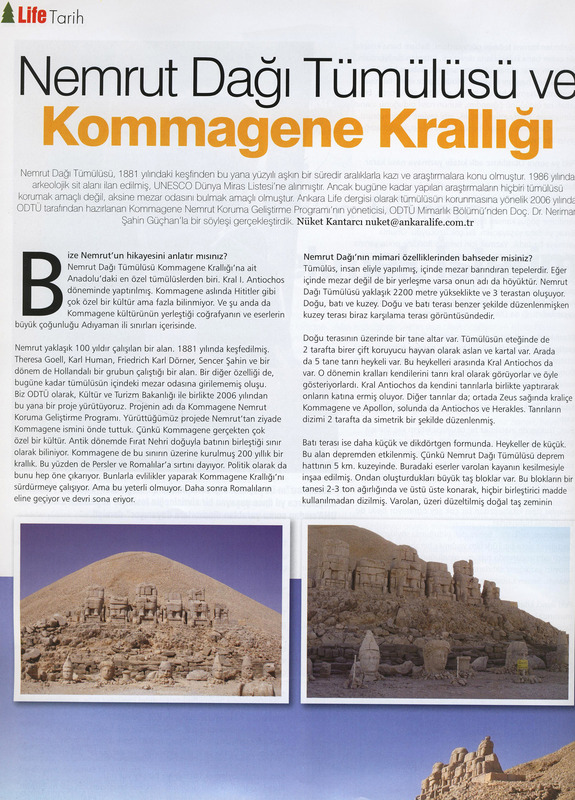 This interview was published in the December-January 2009-2010 issue of the magazine under the title ‘Nemrut Dağı Tümülüsü ve Kommagene Krallığı’. 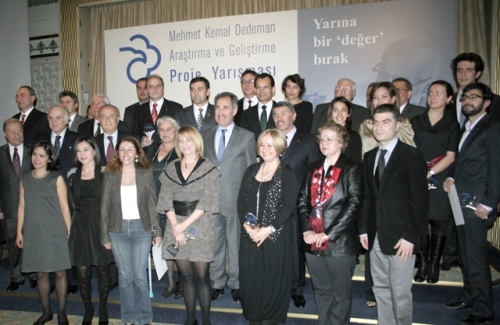 The 2009-10 Academic Year of Adıyaman University was opened with a ceremony and activities, joined by the Minister of Culture and Tourism, during which Assoc. 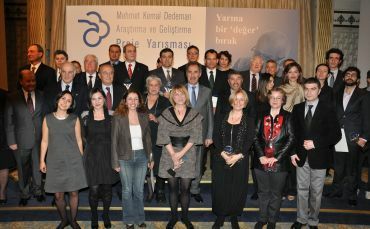 Prof. Dr. Neriman Şahin Güçhan and Inst. Sevin Osmay of the CNCDP Team and Saadet Sayın, project author of the Environmental Design and Visitor Centre Projects made presentations. 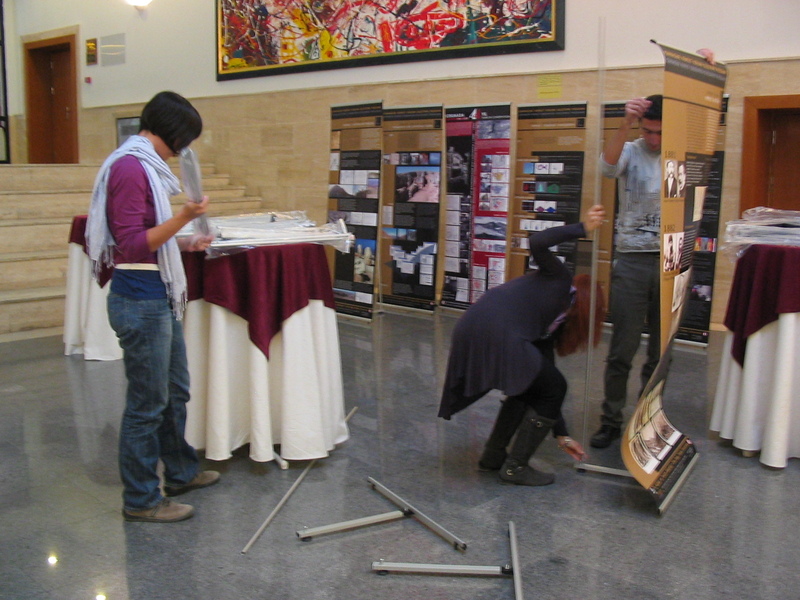 An exhibition about the CNCDP was held as part of these activities. 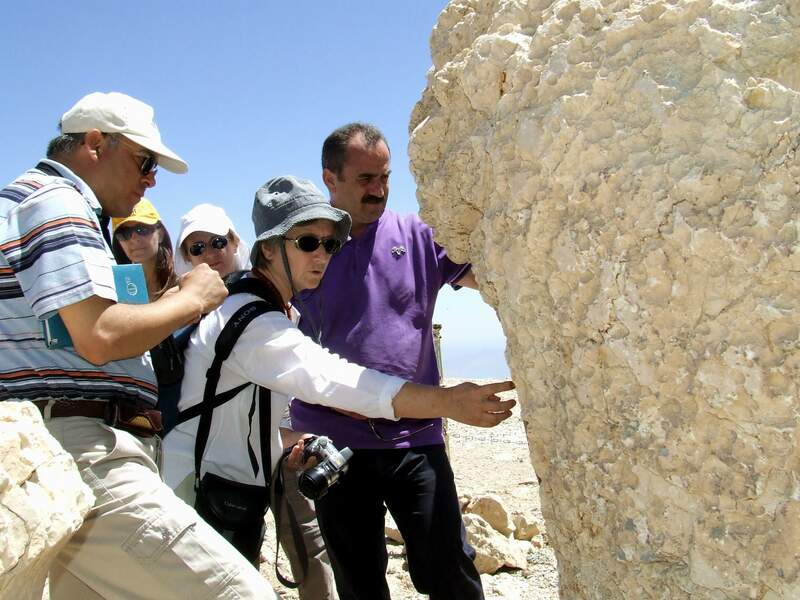 The Minister visited the Tumulus of Mt Nemrut and was informed about the project process. 3 types of brochures are now available. 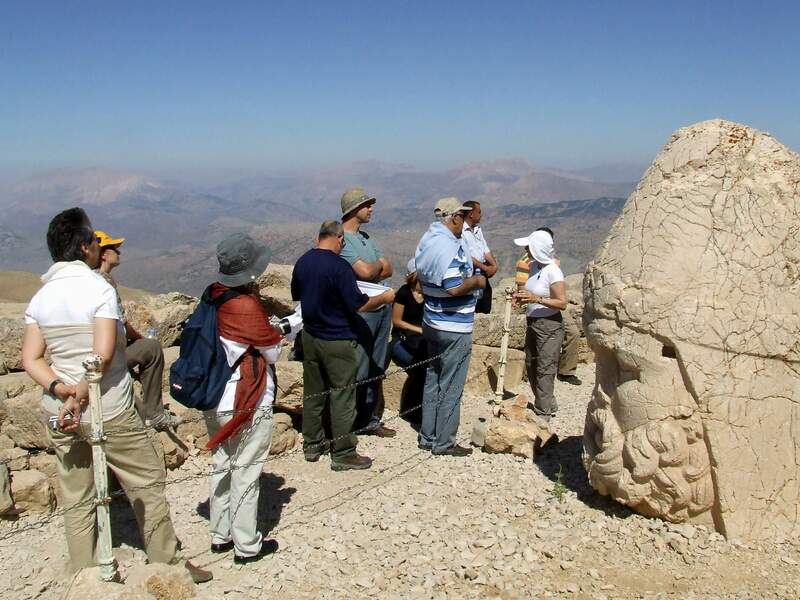 The first brochure gives general information about CNCDP, the second one is about the historical background and architectural features of Mt Nemrut, and the third one explains the inscriptions and the importance of the Lion Horoscope. NTV correspondent Ferit Binzet interviewed CNCDP Coordinator Assoc. 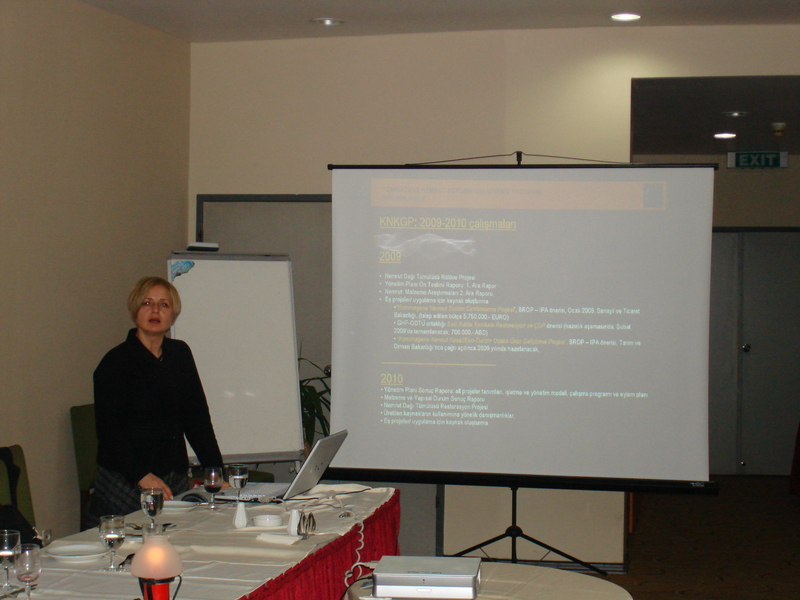 Prof. Dr. Neriman Şahin Güçhan and CNCDP Co-Coordinator in Mt Nemrut about the latest stages of the programme. 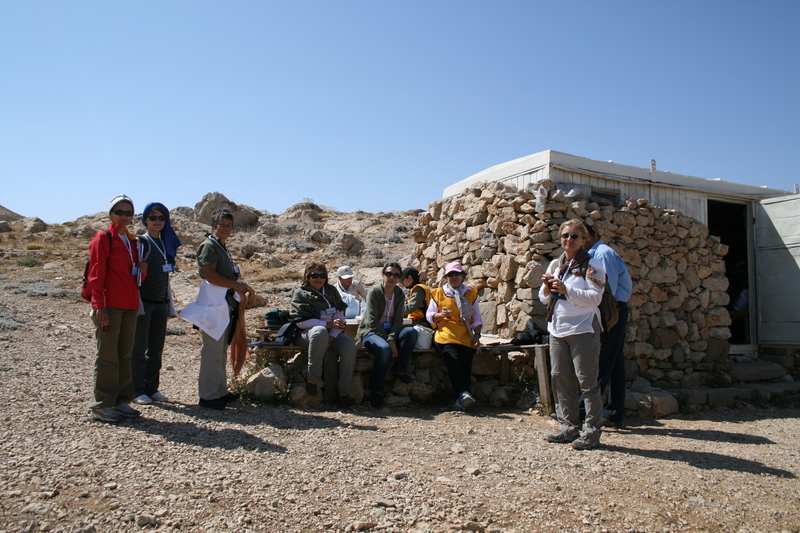 A team of 27 persons from different specializations conducted field work in various groups. 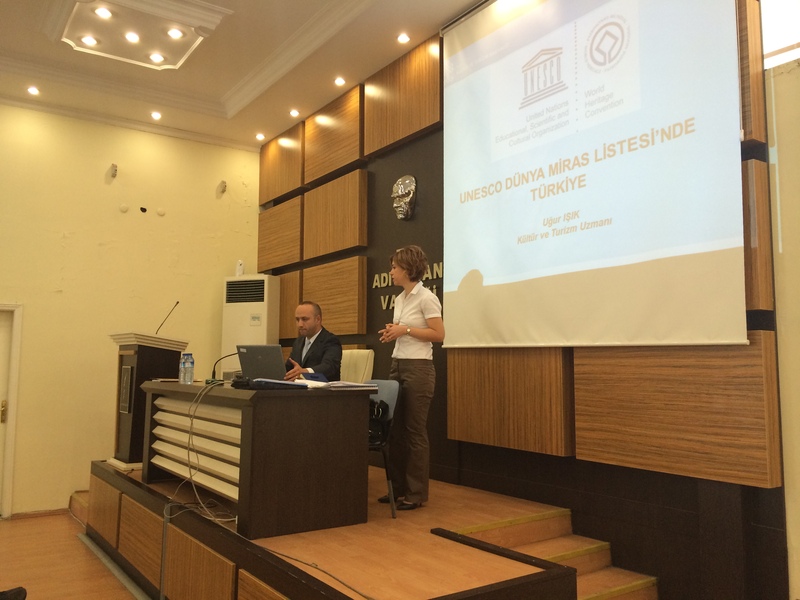 An archive survey was carried out at the Adıyaman Province Special Administration, Adıyaman Museum Directorate, Adıyaman General Directorate of Land Registry and Cadastre, Adıyaman Provincial Directorate of Public Works and Adıyaman Municipality. 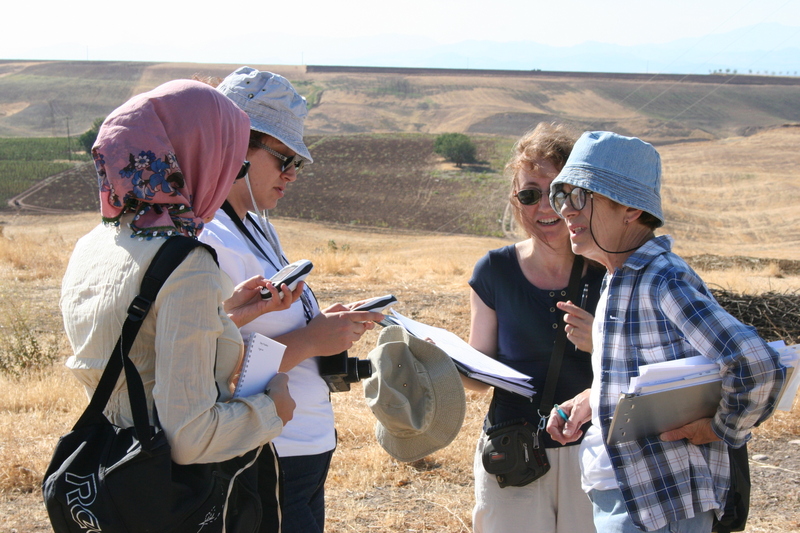 Data was collected thematically in relation to the management plan that is being prepared for 14 places in addition to the Tumulus of Mt Nemrut. Interviews continued with local stakeholders. 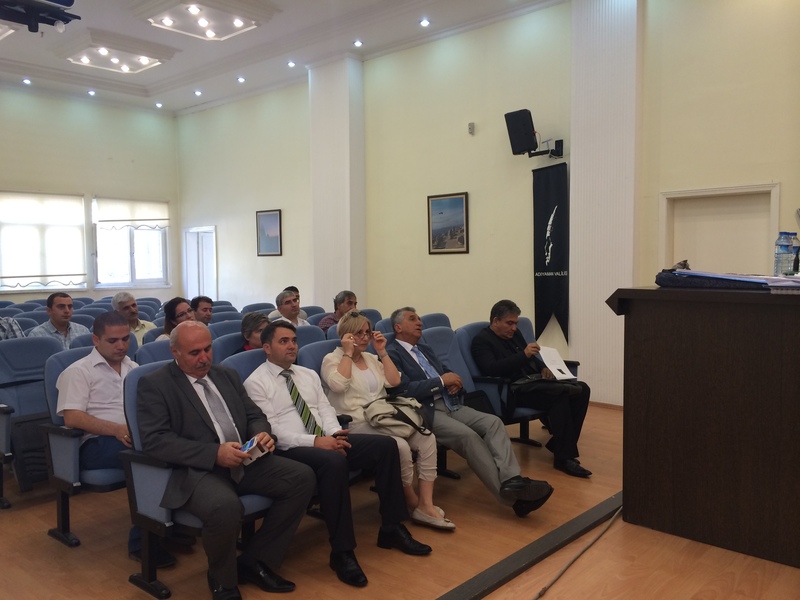 Meetings were held with stakeholders as part of the Commagene-Nemrut Tourism-Based Revitalization Project (KN-TOC). 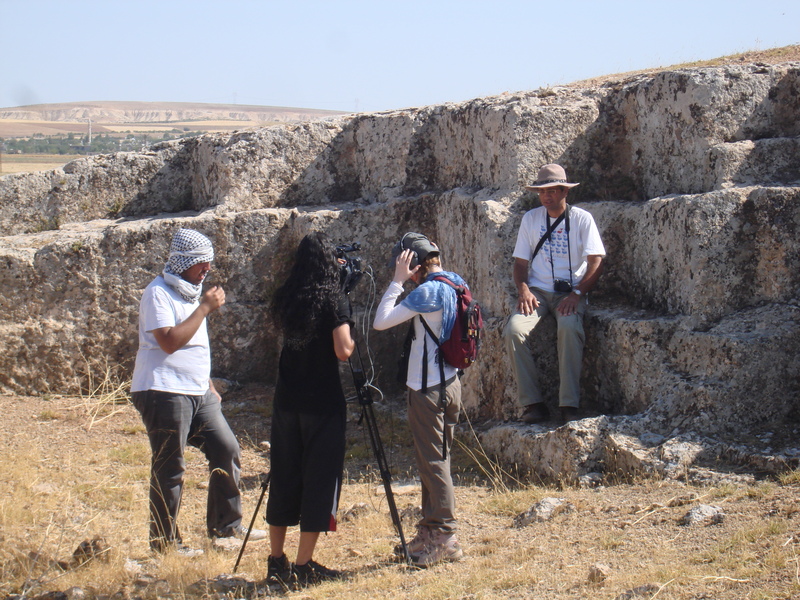 A team from METU-GISAM (Audio-Visual Research and Production Center) recorded CNCDP team’s work on site together with the cultural and natural heritage of the region to produce a documentary about CNCDP working process. 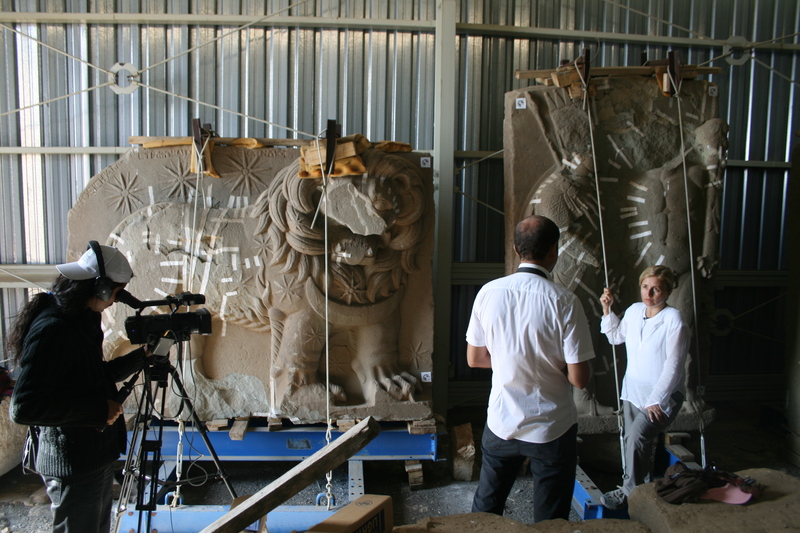 Mr. Ertuğrul Günay, the Minister of Culture and Tourism, was briefed about of the CNCDP’s completed stages, suggestions concerning the project process and work to be carried out in 2009-10. 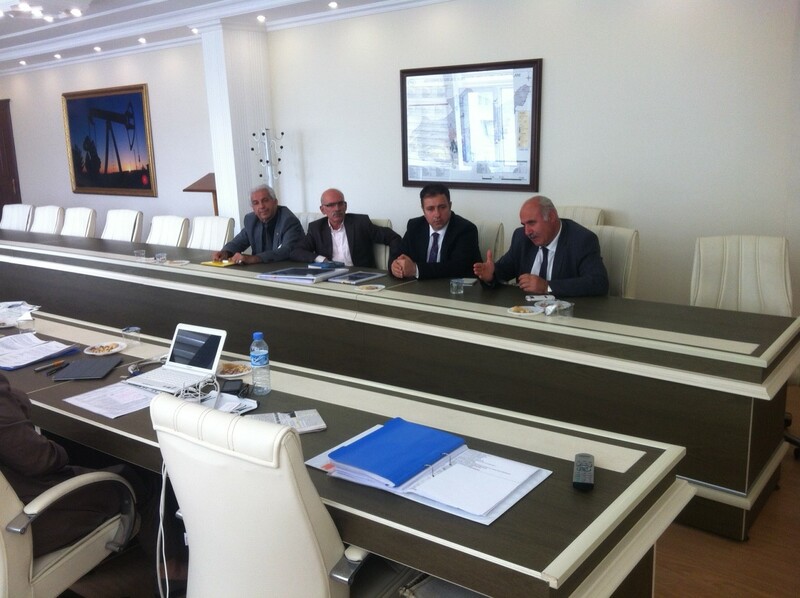 The meeting was joined by Ahmet Aydın, Mehmet Erdoğan and Şevket Gürsoy, the MPs of Adıyaman Province; Orhan Düzgün, the General Director of Cultural Assets and Museums; Serhad Akcan, Assistant General Director; Kalbiye Noyan, Director of the Restoration and Building Works Section; related project controllers at the Ministry of Culture and Tourism; and members of the CNCDP team, including Assoc. 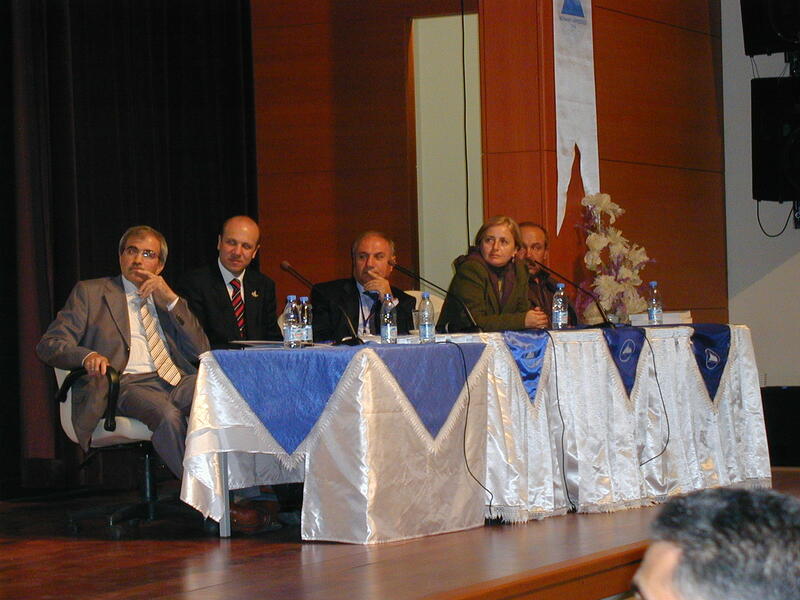 Prof. Dr. Neriman Şahin Güçhan, Prof. Dr. Tamer Topal, Assist. Prof. Dr. Ahmet Türer, Res. Assist. 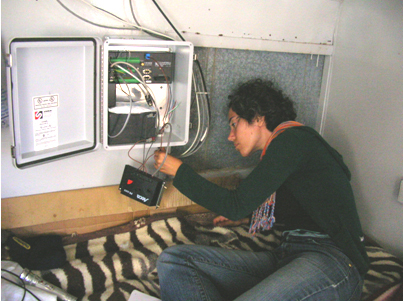 Göze Akoğlu and Conservation architect (MSc) B. Nilgün Öz. The first half hour of the briefing was open to national media. 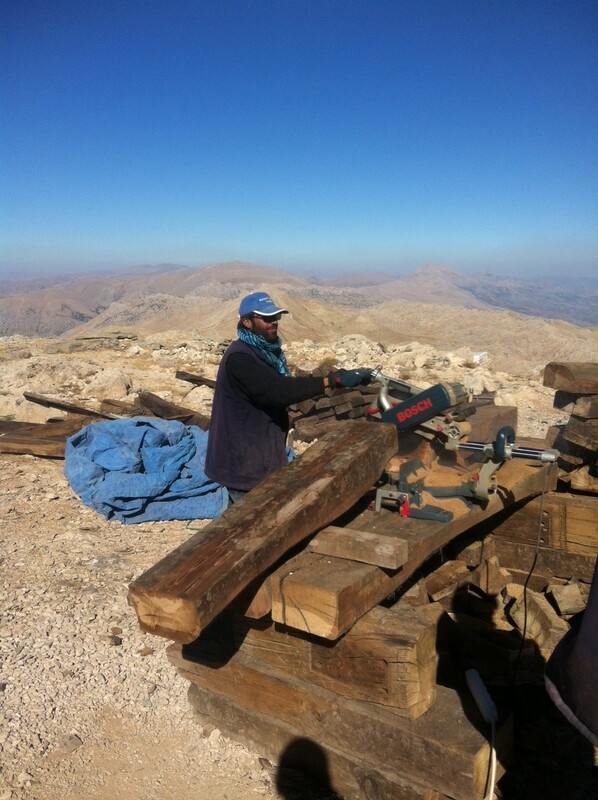 Work began on the Commagene-Nemrut Tourism-Based Revitalization Project (submitted to the Ministry of Industry and Trade within the scope of the Instrument for Pre-Accession Assistance – IPA) with the participation to the ‘Project Definition and Preparation Seminar’ organized by the Ministry of Industry and Trade. Meetings were held with Sayka İnş. Müh. Müş. ve Tic. Ltd. 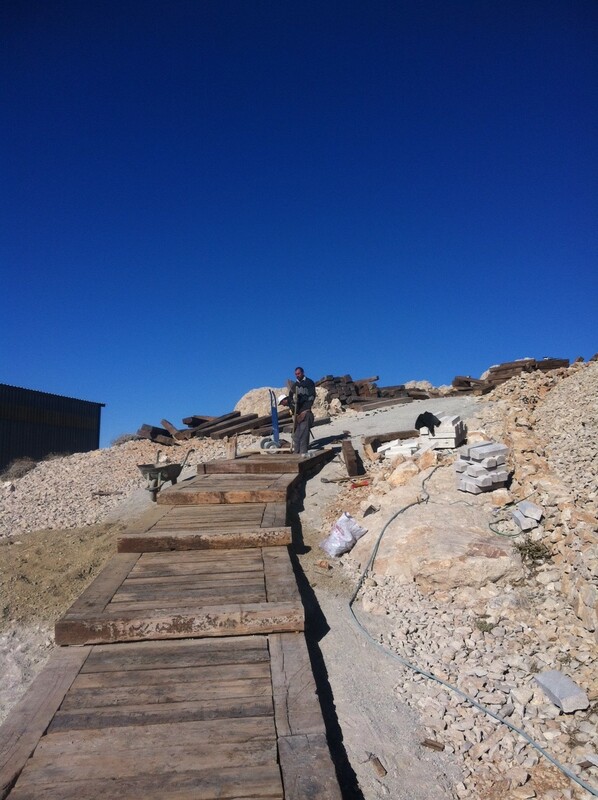 Şti., the firm preparing working drawings for the Mount Nemrut Environmental Design Project and Visitor Centers Project. 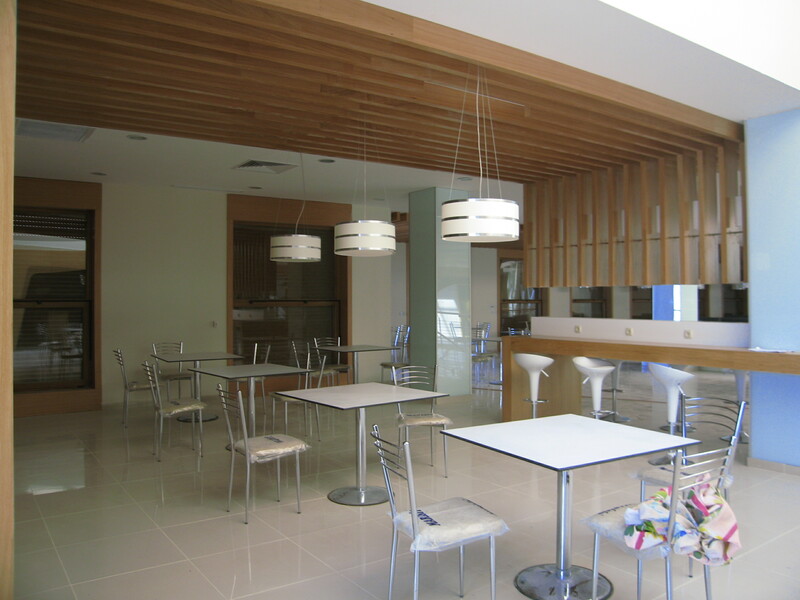 A meeting with a second firm was held to obtain information and sample cover materials. Project Manager Assoc. 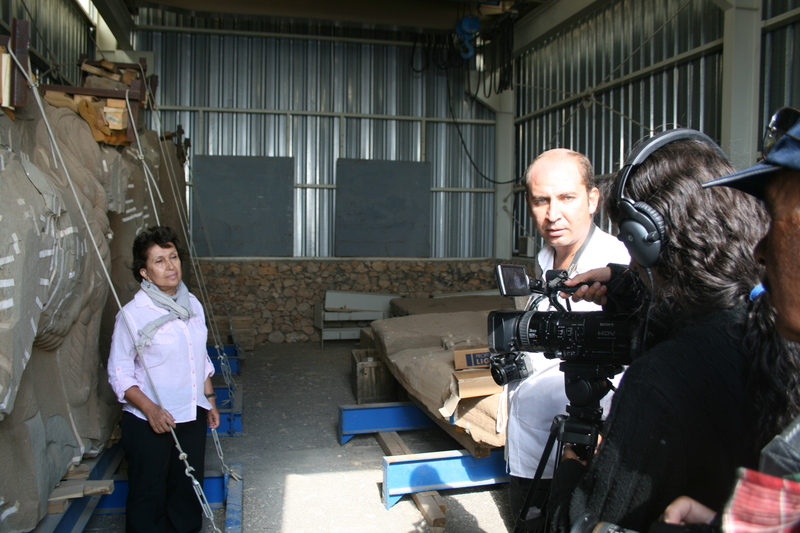 Prof. Dr. Neriman Şahin and Materail Conservation Specialist Prof. Dr. Emine Caner Saltık explained the METU Team works in Nemrut for a documentary film being prepared about Nemrut Mountain Monuments. 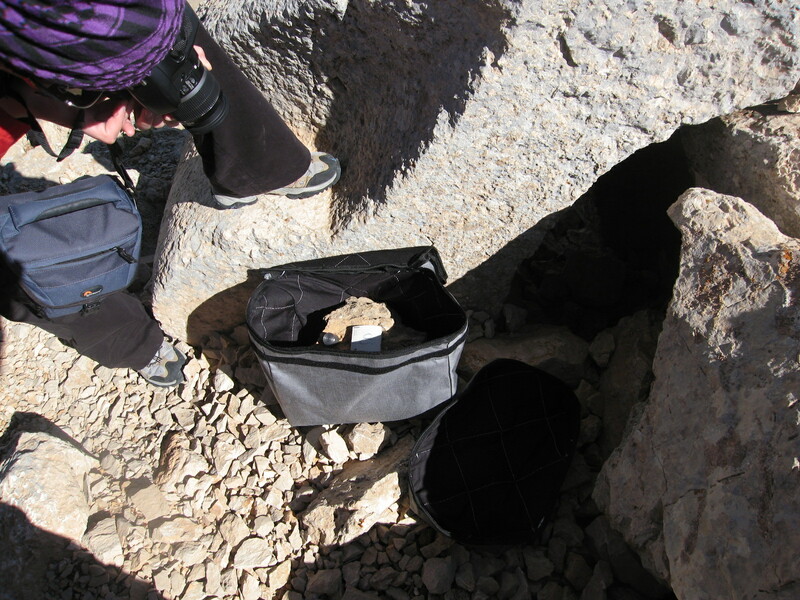 A meeting was held with one of the firms contacted to provide information and samples for cover materials as a method to protect monuments from the adverse effects of winter conditions. Programme coordinator Assoc. Prof. Dr. Neriman Şahin Güçhan met with photographer Ara Güler, who photographed Nemrut in the 1960s, and received documents and valuable information. Programme coordinator Assoc. 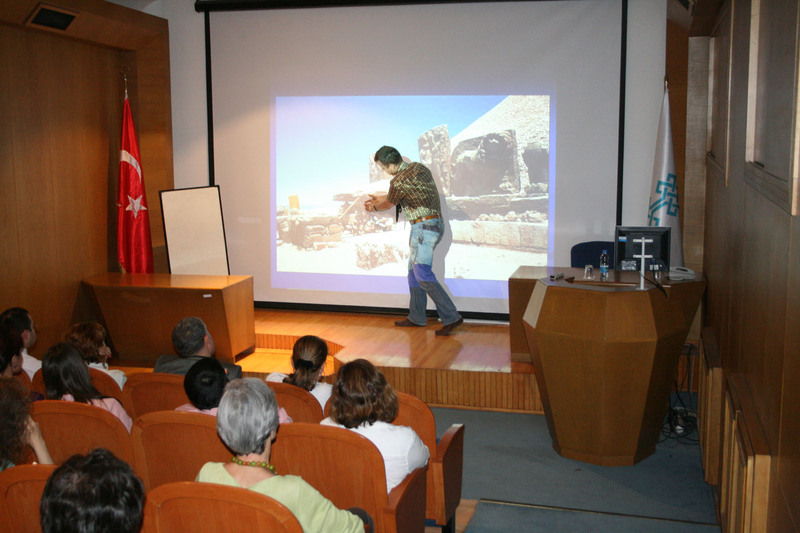 Prof. Dr. Neriman Şahin Güçhan made an introductory presentation about the Commagene Nemrut Conservation and Development Programme at Koç University. The Board and related personnel at the Ministry of Culture and Tourism were presented with information regarding the latest developments concerning CNCDP by programme members Prof. Dr. Emine Caner Saltık, Assoc. 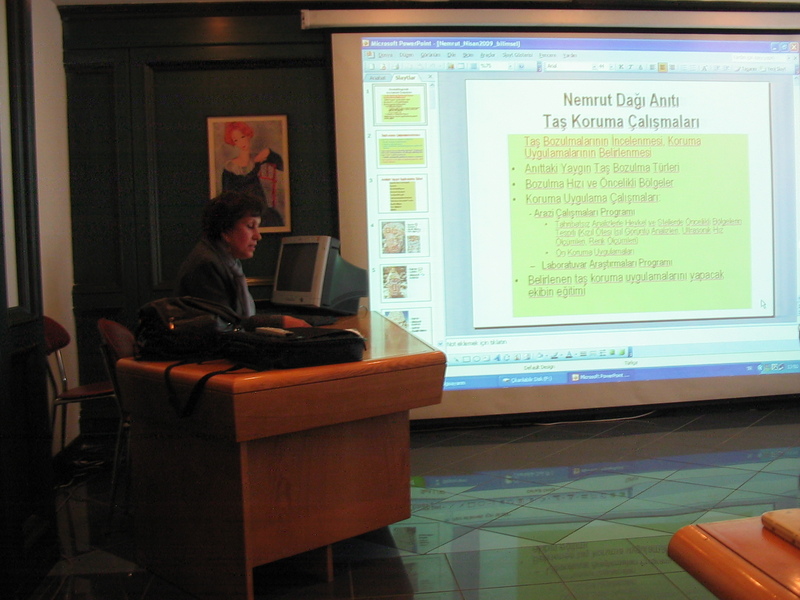 Prof. Dr. Neriman Şahin Güçhan, Assist. 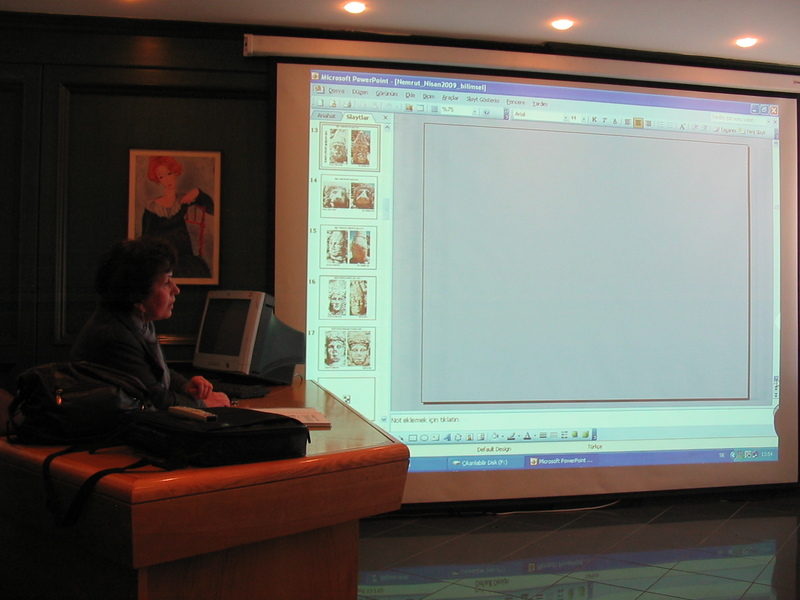 Prof. Dr Güliz Bilgin Altınöz and Instructor Sevin Osmay. CNCDP Coordinator presented the programme to the members of the Conservation and Restoration Specialists Association, covering the background of the programme, explaining finalized items and future actions. Project coordinators from the Ministry of Culture and Tourism met with the CNCDP team to discuss the detailed architectural survey drawings that are being prepared. 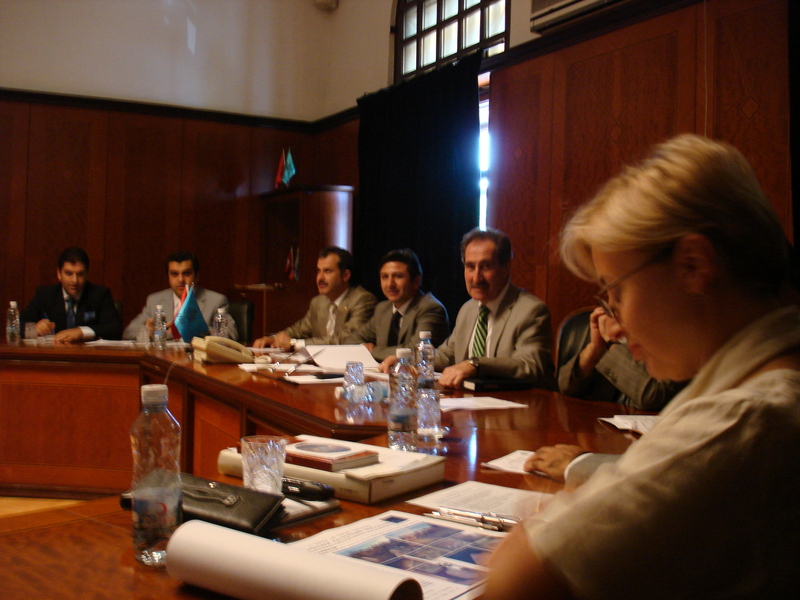 The CNDCP team, together with several other specialists, formed a study group for the project call of the ‘Regional Competitiveness Operational Programme (2007-2009)’, which is run by the Ministry of Industry and Trade, within the framework of the Instrument for Pre-Accession Assistance (IPA), a new programme collecting all pre-accession assistance under a single umbrella for candidate and potential candidate countries during the 2007-2013 period. 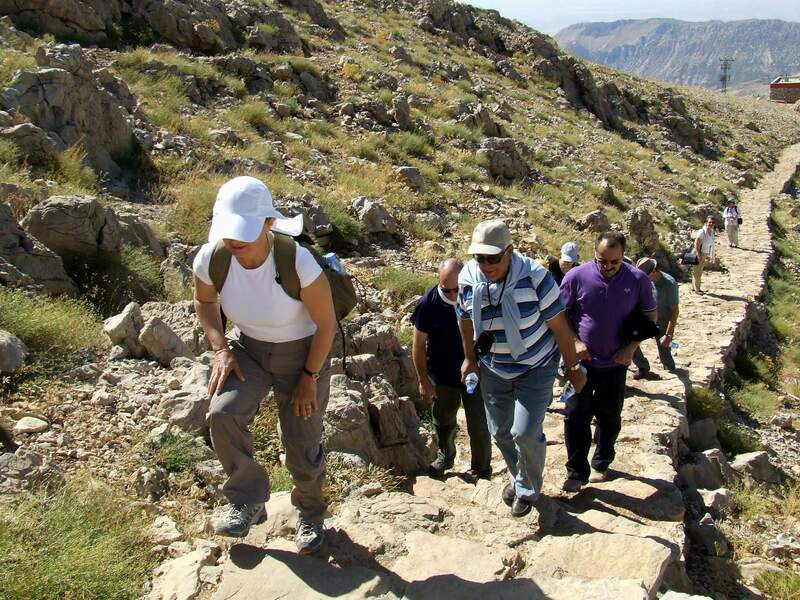 As a result, a project was developed with the title ‘Commagene-Nemrut Tourism-Based Revitalization Project’, through the collaboration of the Governorship of Adıyaman and the Ministry of Culture and Tourism, and submitted to the Ministry of Industry and Trade. 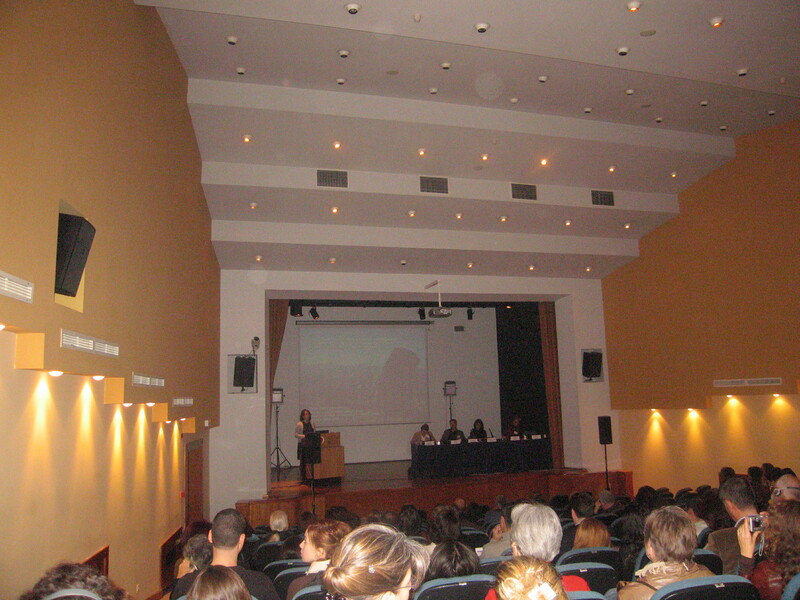 Ömür Bakırer, Sevin Osmay, Neriman Şahin Güçhan, Anlı Ataöv and Güliz Bilgin Altınöz from the CNCDP made presentations about the programme during the workshop ‘Preserving Places: Managing Mass Tourism, Urban Conservation and Quality of Life in Historic Centers’, organized by METU and Istituto per la Conservazione e la Valorizzazione dei Beni Culturali (Institute for the Conservation and Enhancement of Cultural Heritage), which took place at the Culture and Convention Center in METU. 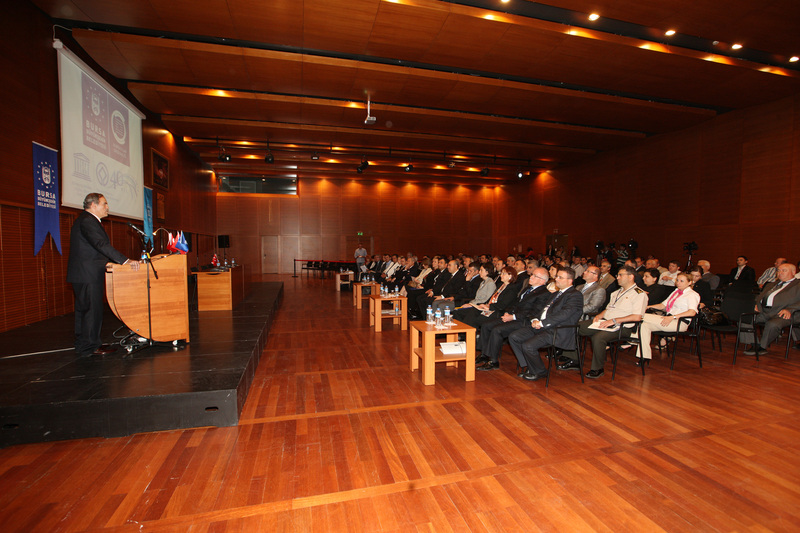 A draft version of the CNCDP website, prepared with the aim of introducing the programme to the public at large, was presented to the related personnel at the Ministry of Culture and Tourism. 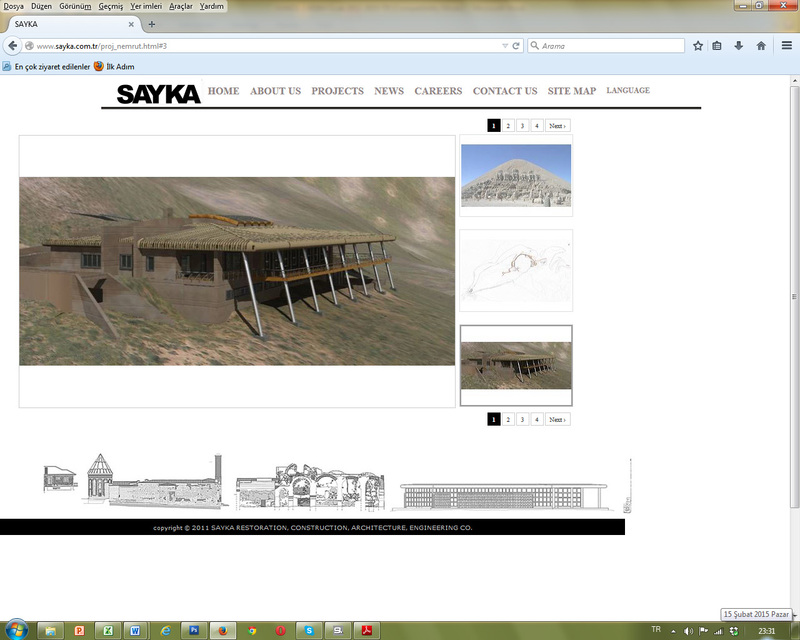 The general layout and graphic design as well as web hosting issues were discussed. 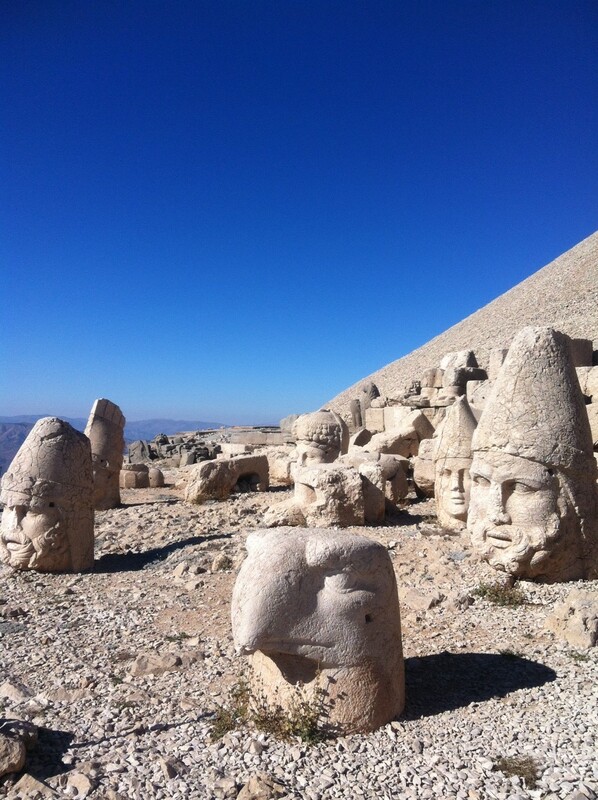 The CNCDP Structural Condition Research Team visited Nemrut in order to solve problems encountered with the data acquisition system set up on site, collect long-term dynamic data from several sculptures and monitor the effect of the wind and other micro-vibrations. 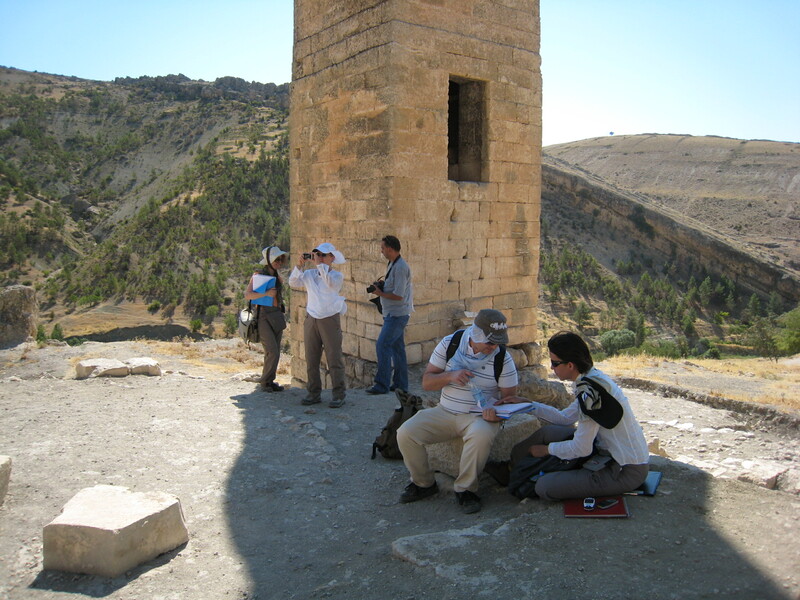 The architectural survey team, measuring the sculptures, architectural blocks and near environs in Nemrut, was joined by the CNCDP Coordinator to discuss the level of detail of the architectural survey in the Processional Ways. CNCDP Coordinator Neriman Şahin Güçhan and CNCDP team member Erhan Öztepe appeared at a live program on Mercan TV, a local TV channel, to discuss the latest developments in Nemrut and to introduce the CNCDP. 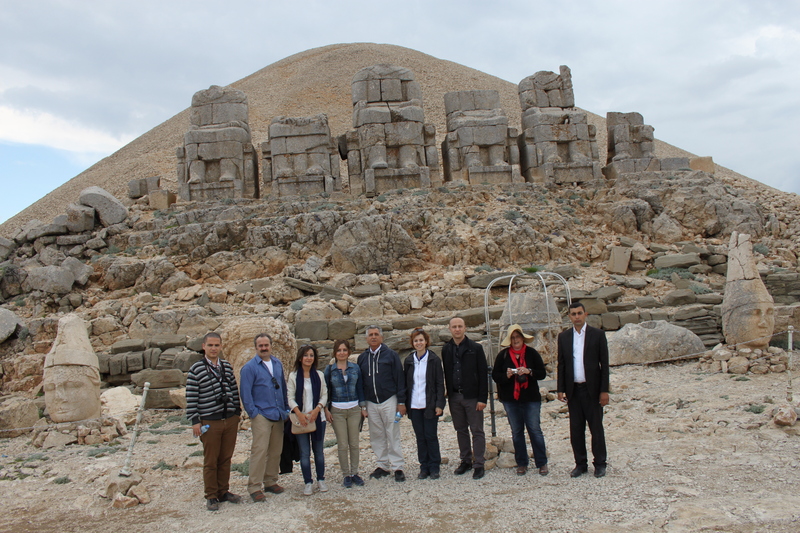 Together with the CNCDP Coordinator Neriman Şahin Güçhan, the Scientific Advisory Committee and related personnel from the Ministry of Culture and Tourism visited the Tumulus of Mount Nemrut and several other places that could be included into the management plan area. 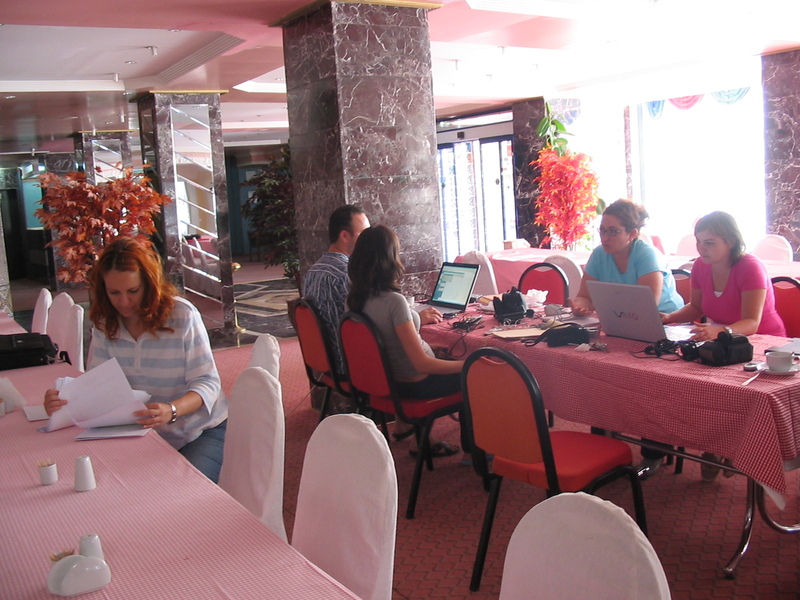 The CNCDP Participatory Planning Team made interviews with interest groups in relation to the decision-making process of the management plan. 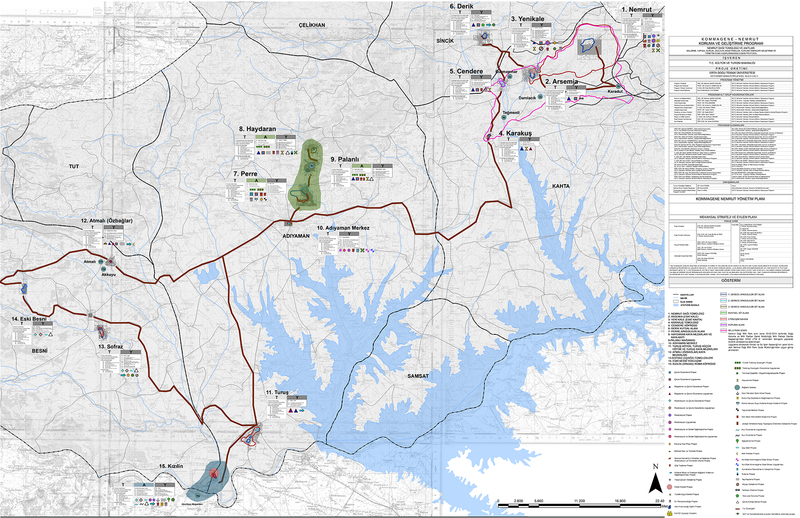 The interviews comprised meetings with 36 persons from the local administration, personnel and inhabitants of 14 sites that will most likely be included in the management plan. The team distributed a questionnaire to these people in order to learn their views and they also determined persons to be met in the upcoming stages. 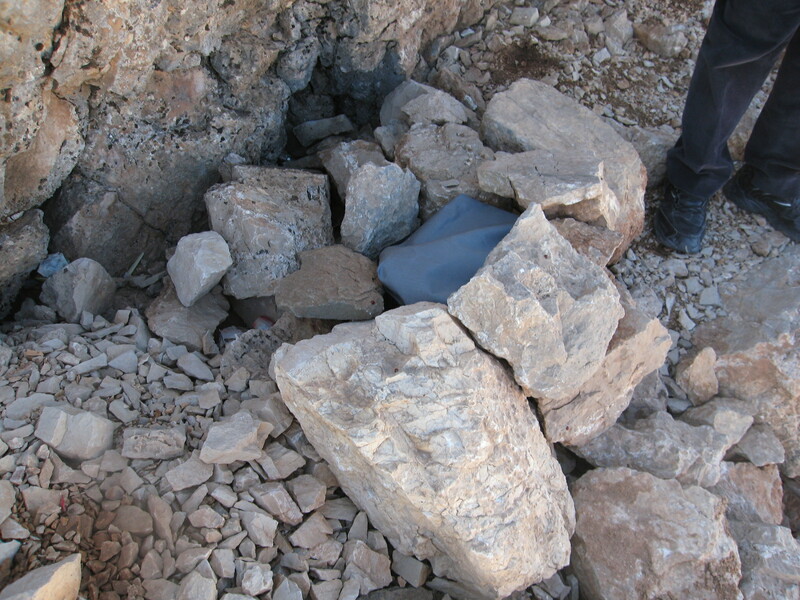 Following preliminary preparation and collection of necessary informative documents, two teams consisting of 21 people began to work on site. 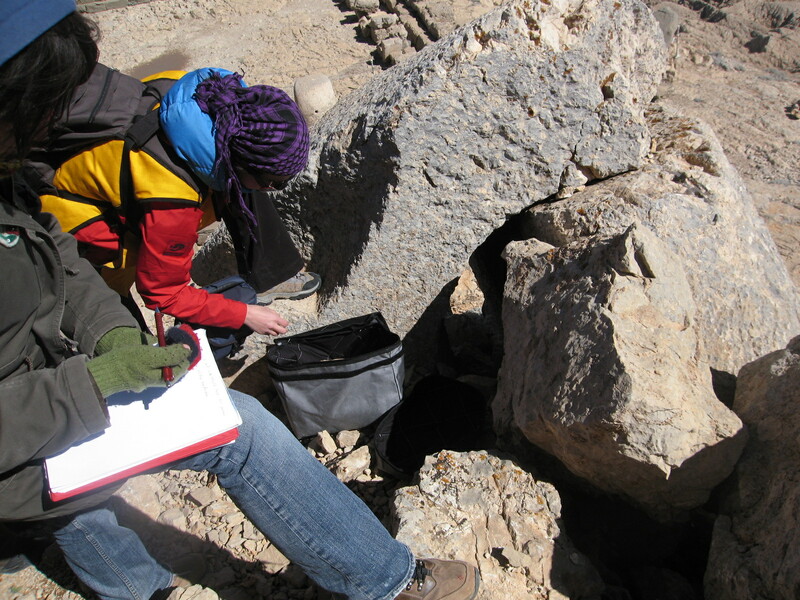 The first team concentrated on the Tumulus of Mount Nemrut, determining deteriorations in the materials and carrying out material analysis on samples, while second team gather detailed data for the future planning works from 15 different places that are likely to be included in the management plan. The Scientific Advisory Committee, related personnel from the Ministry of Culture and Tourism and the CNCDP team had a meeting to discuss the works carried out to date. 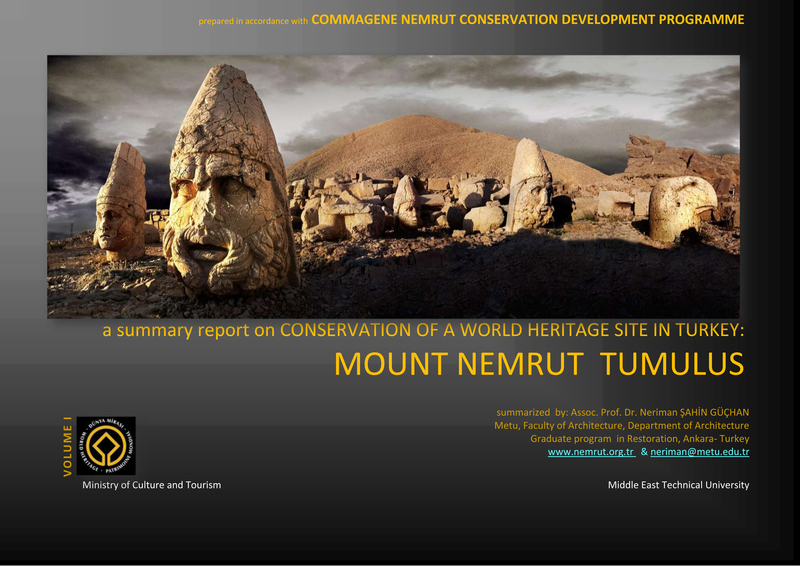 A situation report on the Tumulus of Mount Nemrut, prepared by CNCDP in October 2007, was presented to the UNESCO Turkish National Commission within the framework of ‘Determination of the Current Situation of World Heritage Sites in Turkey’. 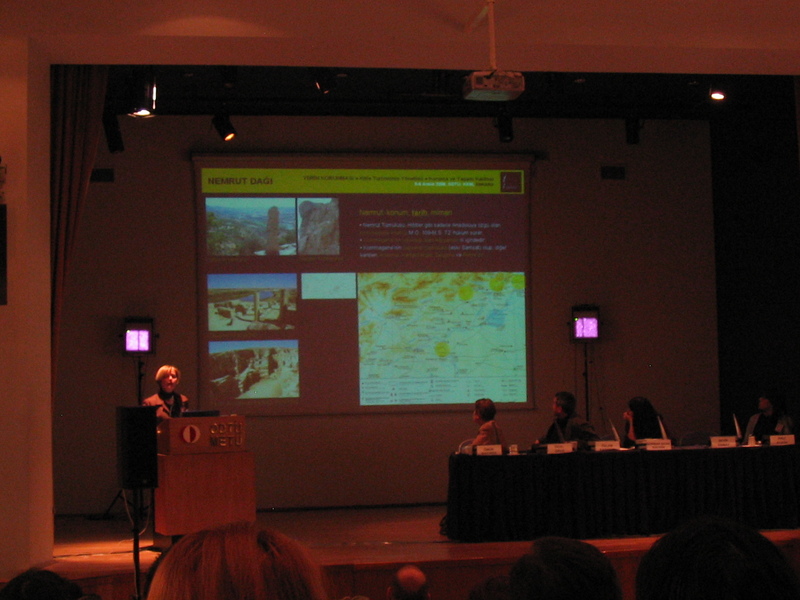 CNCDP Assistant Coordinator Güliz Bilgin Altınöz made a presentation titled ‘Decision Support For Conservation Management Process: GIS For Commagene – Nemrut Conservation and Development Program’ in Italy at the conference ‘GIS e Carta Dei Beni Culturali’. 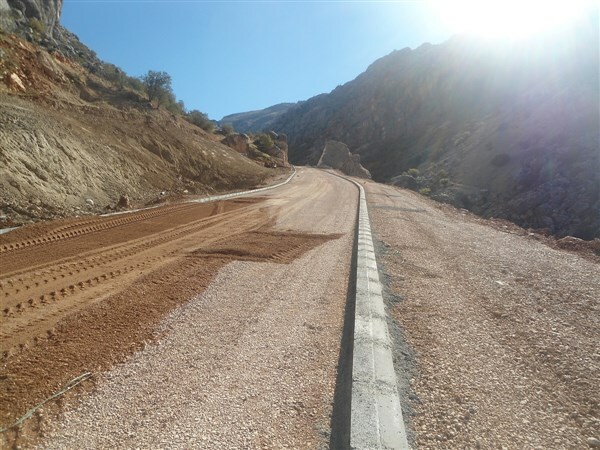 A meeting, presided by the Ministry of Culture and Tourism Undersecretary Ismet Yılmaz, was held about the Malatya-Adıyaman connection road. 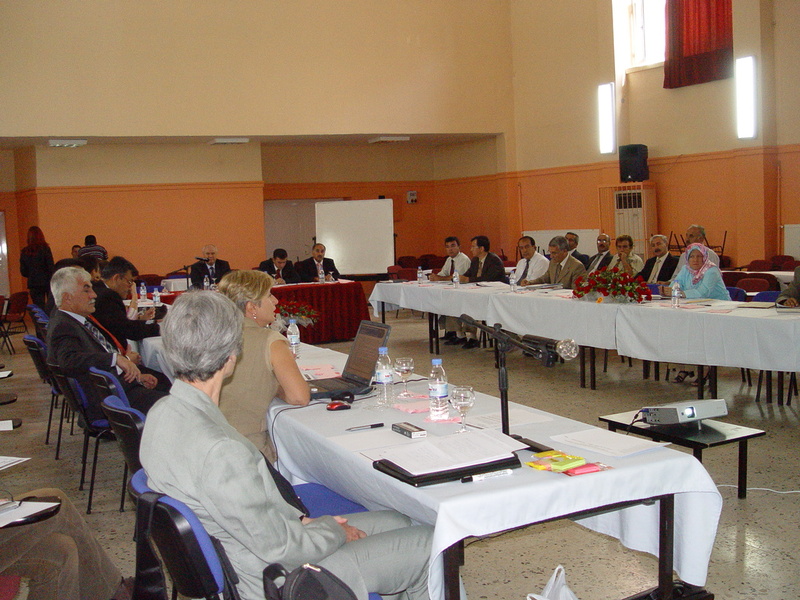 CNCDP Coordinator Neriman Şahin Güçhan participated in the Şanlıurfa Conservation Council meeting to brief the council members about the documents submitted to the Ministry of Culture and Tourism on November 6, 2007 and the result reports of the meeting with the Scientific Advisory Committee on January 18, 2008. A meeting was held with the Scientific Advisory Committee to discuss the material submitted to the Ministry of Culture and Tourism. 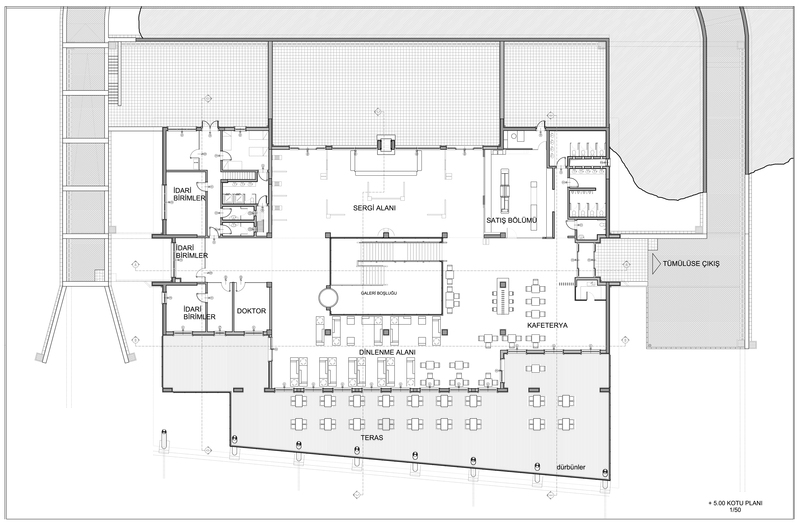 The Preliminary Environmental Project and the Visitor Centers Architectural Project were revised following this meeting based on the suggestions and criticisms of the committee members. Presided by the Minister of Culture and Tourism, Ertuğrul Günay, a meeting was held with the related personnel of the Ministry of Culture and Tourism and CNCDP Team to evaluate the works carried out to date. The Governor of Adıyaman, Adıyaman MPs, the Scientific Advisory Committee, CNCDP Team and related personnel from the Ministry of Culture and Tourism had a meeting to discuss the works carried out to date. Submission of Urgent Interventions Plan Report, Collection and Submission of Previous Documents, Research Methodology of the Boundaries of the Management Plan, Preliminary Environmental Design Project, Preliminary Architectural Projects and Technical Tender Documents for Architectural Construction of Visitor Centers and various service buildings at the site, as well as printed and digital copies of projects and reports to the Ministry of Culture and Tourism. 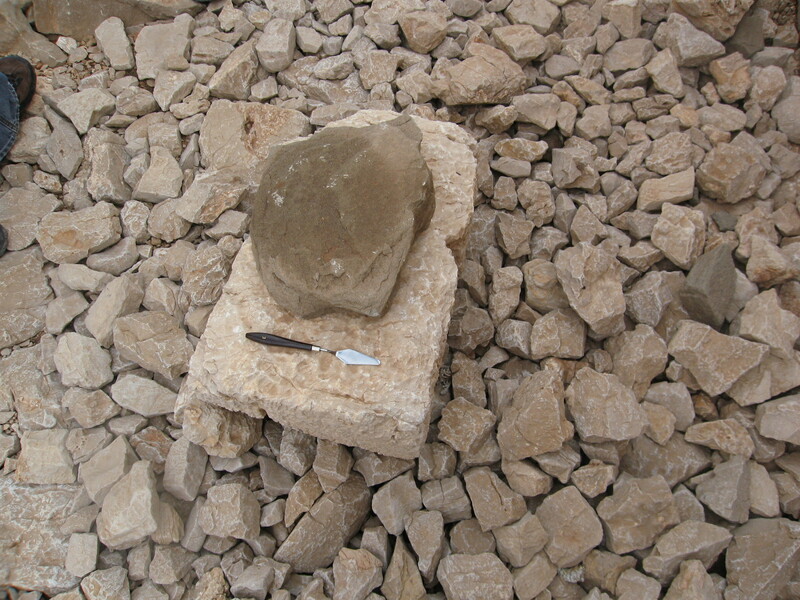 1999 dated architectural survey of the Tumulus of Mount Nemrut and its nearby environs are collected for the METU-CNCDP archive in order to be used for historical research. 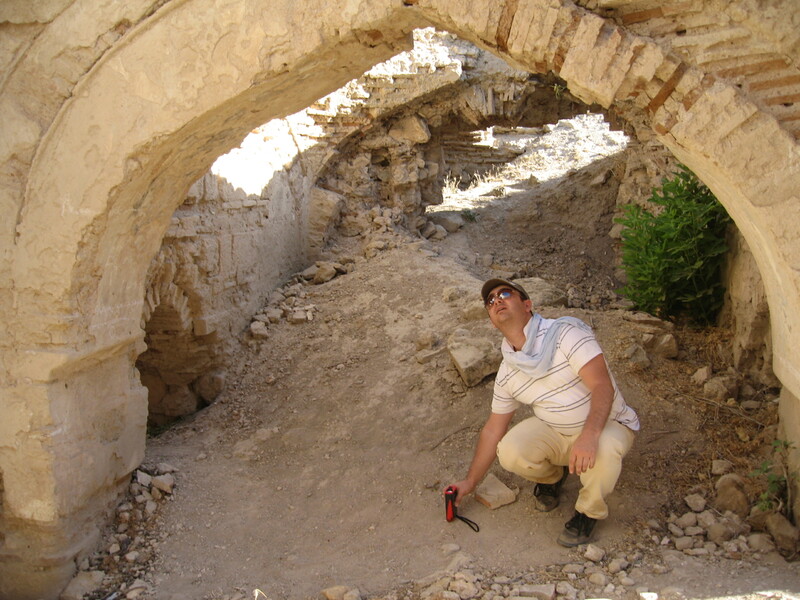 Geological engineer Gökhan Büyükkahraman investigated the possible locations of Visitor Centers to be constructed, and analyzed the site to determine geologically appropriate locations; civil engineers Ahmet Türer and Yasemin Didem Aktaş performed repairs and revisions on measuring instruments which were previously installed and mounted several more instruments. 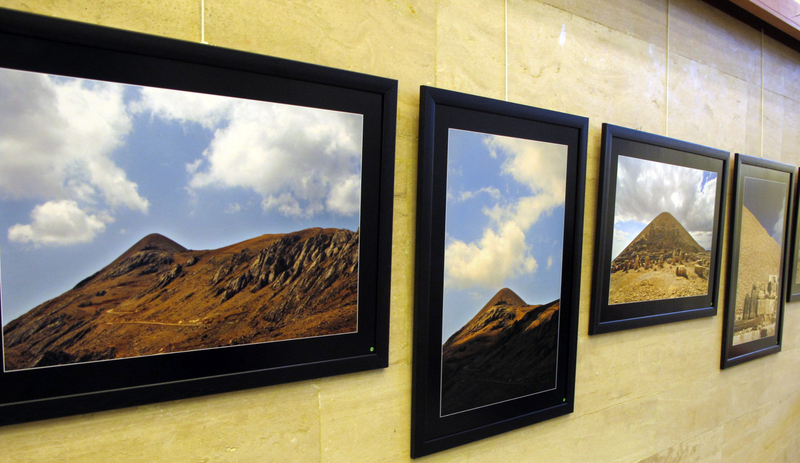 Digital and printed copies of orthophoto maps showing the Tumulus of Mount Nemrut and its environs (outsourced by Southeastern Anatolia Project Regional Development Administration) are collected from the Ministry of Culture and Tourism. 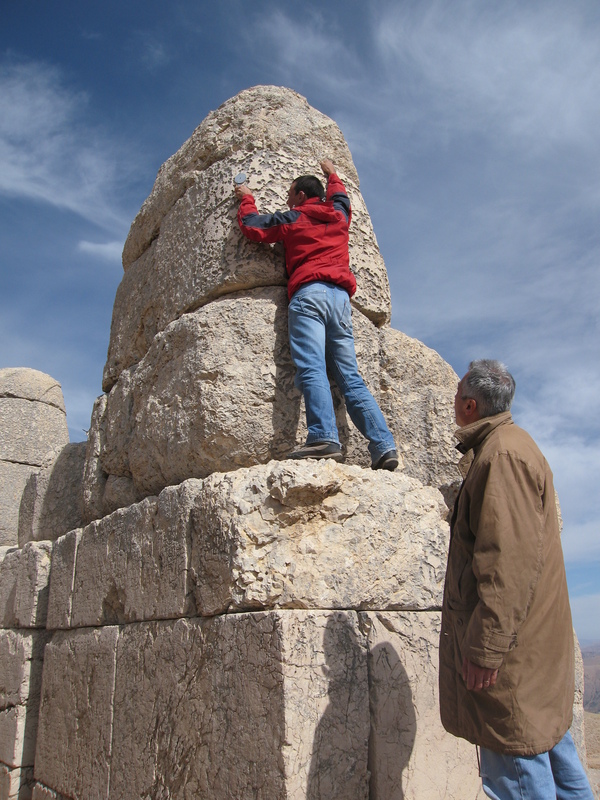 1/25.000 ve 1/100.000 maps of Tumulus of Mount Nemrut and its environs are collected from the General Command of Mapping. Project Coordinator Neriman Şahin Güçhan attended a meeting of Şanlıurfa Conservation Council concerning Nemrut and informed council members about the ongoing program. 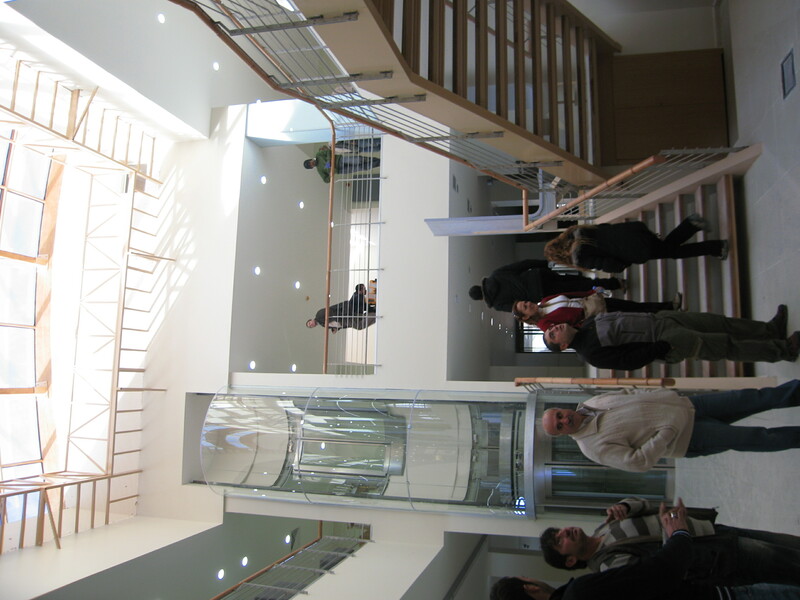 In order to accelerate administrative process and to work cooperatively with all related institutions, METU offered a draft protocol, following which a meeting was organized with the coordinators. Seven representatives of related ministries and institutions together with two representatives from METU discussed and agreed on the draft. 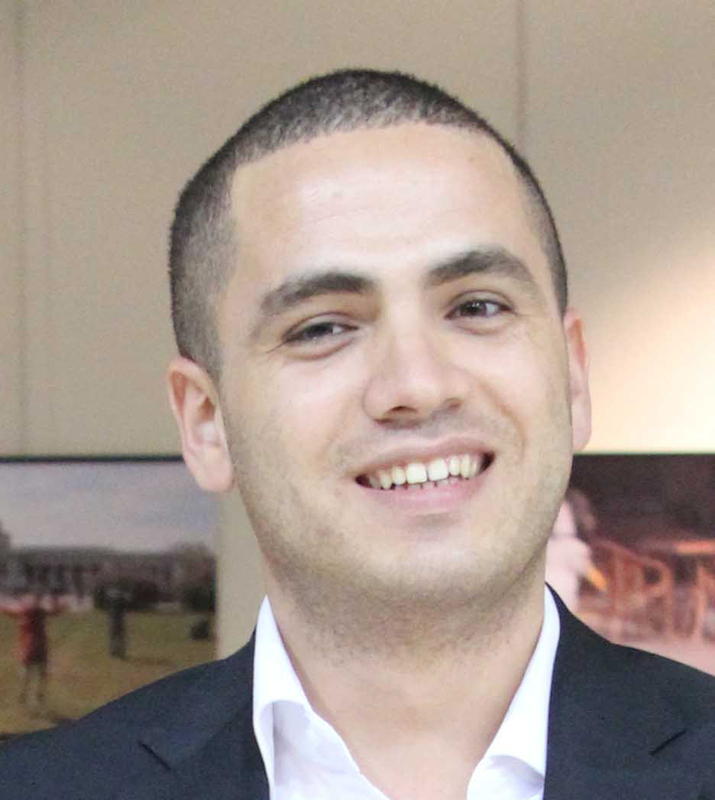 The draft protocol was forwarded to the Ministry of Culture and Tourism for the necessary procedures. A meeting was organized at METU with the controllers from Ministry of Culture and Tourism in order to discuss latest developments in CNCDP. 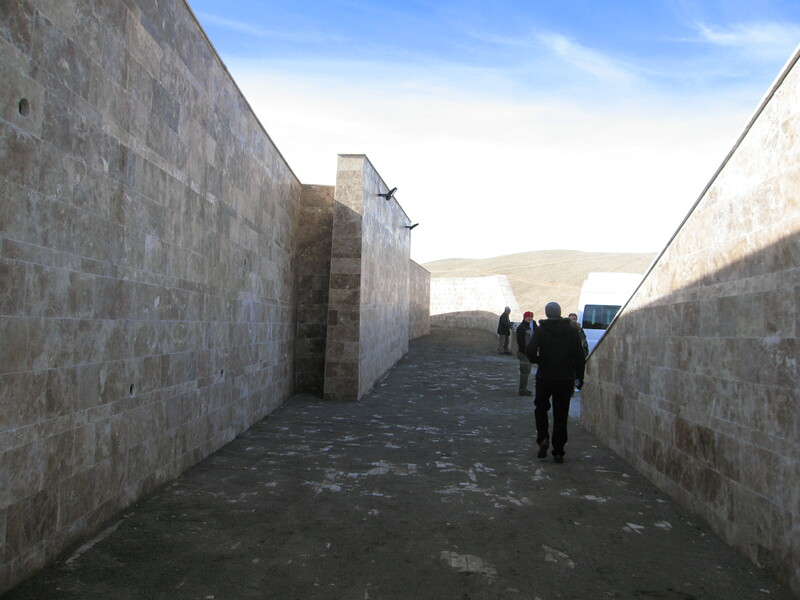 A preliminary meeting was organized concerning the VisitorCenter to be constructed at the south of the Tumulus of Mount Nemrut. The meeting was attended by representatives from the Ministry of Culture and Tourism; Prof. Dr. Mustafa Kemal Yalınkılıç from the General Directorate of Nature Preservation and National Parks, Ministry of Environment and Forestry; and CNCDP administration. A meeting with Gülcan Acar (author of the book Nemrud and an officer at the General Directorate of Tourism within the Ministry of Culture and Tourism) was organized and her photographs were examined. 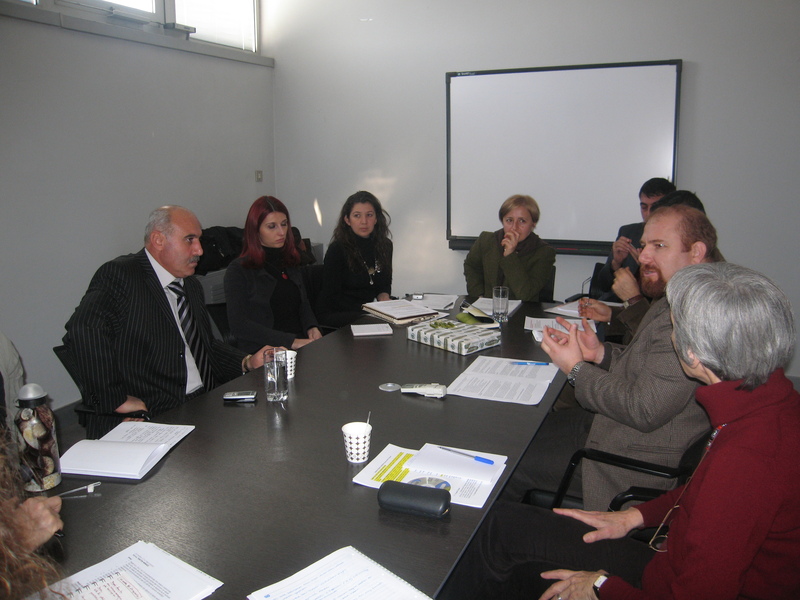 A meeting was organized between CNCDP and institutional coordinators as a part of Management Plan studies (three coordinators from METU; eight coordinators from the Ministry of Culture and Tourism, Ministry of Public Works and Settlement, Southeastern Anatolia Project Regional Development Administration, Ministry of Environment and Forestry). 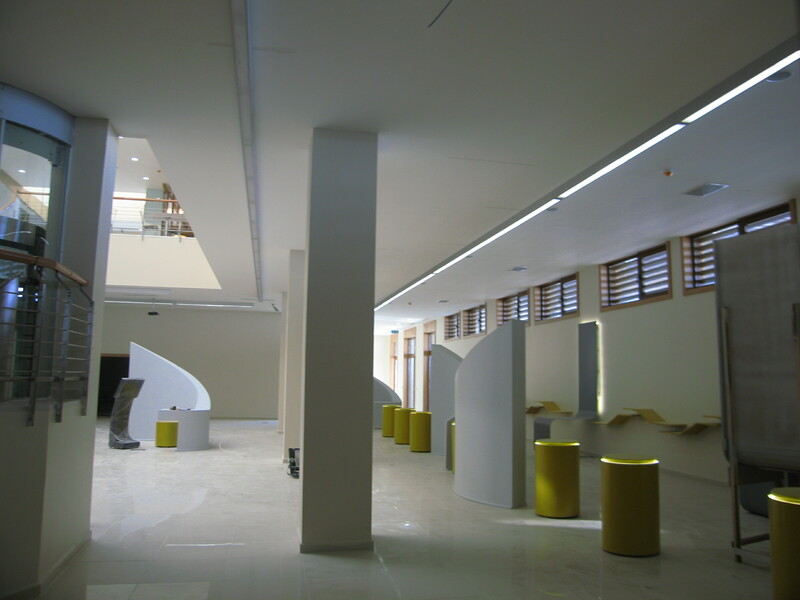 CNCDP was introduced and problems of the VisitorCenter were discussed, after which a collective vision was developed. 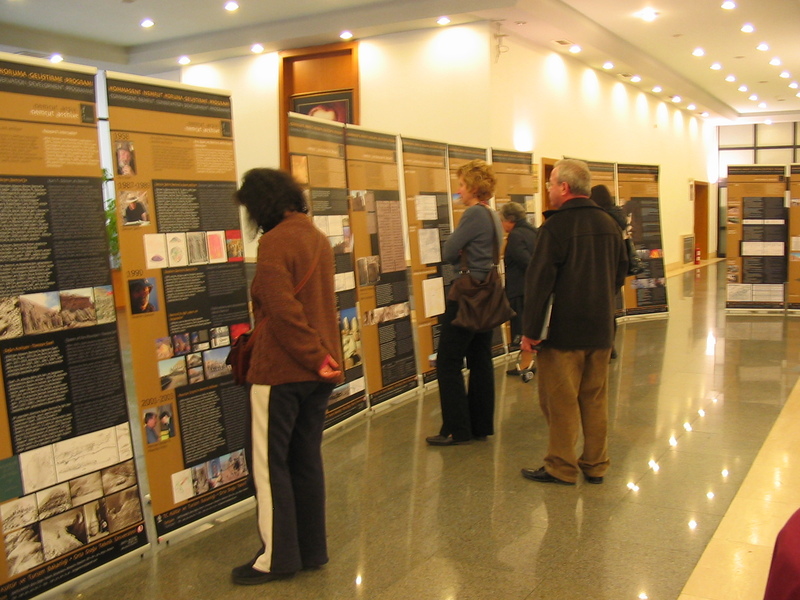 Printed and digital copies of the Preliminary Submission Report of Site Data, together with its appendices, were submitted to the Ministry of Culture and Tourism. Submitted documents are: General Site Data, Material Research, Structural Research, Geological Research, Urgent Interventions, Historical and Archaeological Research, Research on the Boundaries of the Management Plan, Planning and Management Studies, Studies on Social Planning and Participation. CNCDP team attended the Adiyaman Symposium: Crossing of Civilizations to build up local connections with people and institutions. 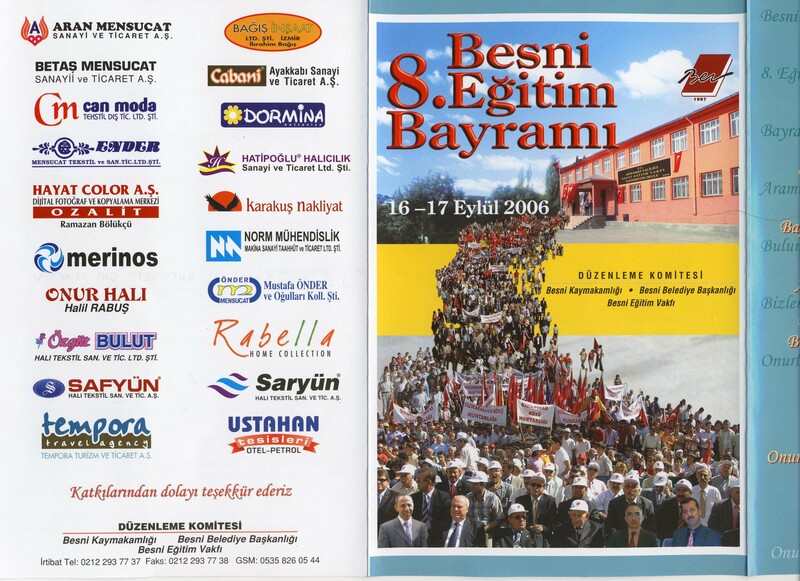 CNCDP team attended the Besni Education Festival to build up local connections with people and institutions. Within the context of the Management Plan, a meeting with 38 stakeholders was organized including the Governorship, district governors (kaymakam), district offices, press and several non-governmental organizations. 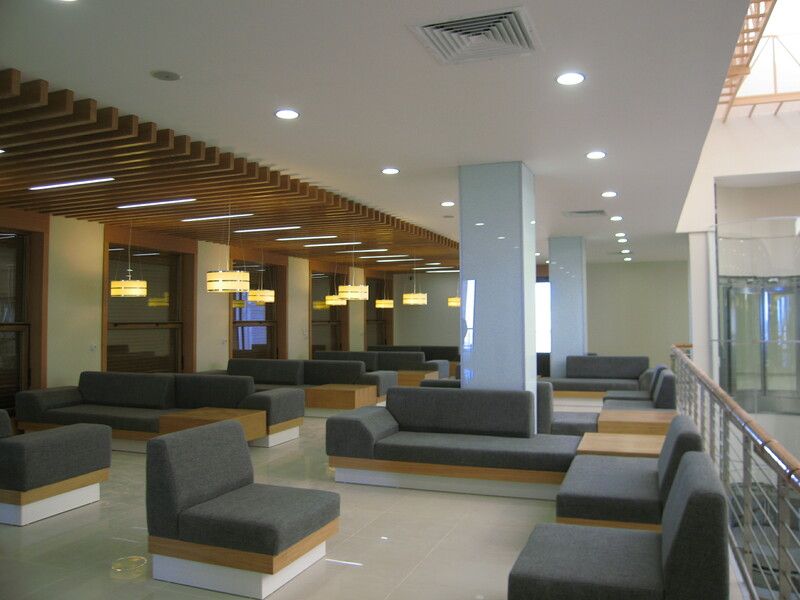 Before the site survey, necessary preparations and document collection were completed; required permissions were obtained. 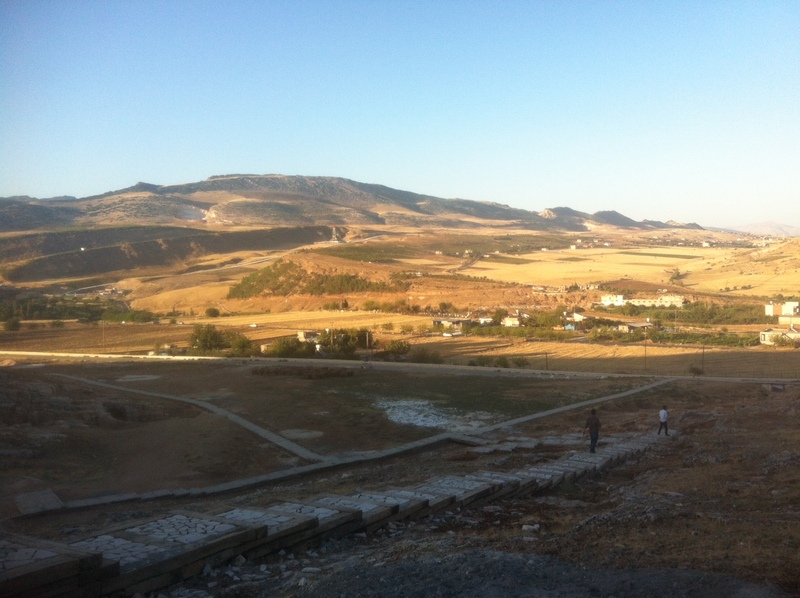 The first site survey started on September 6 and continued for 14 days at Nemrut and Adıyaman in general. 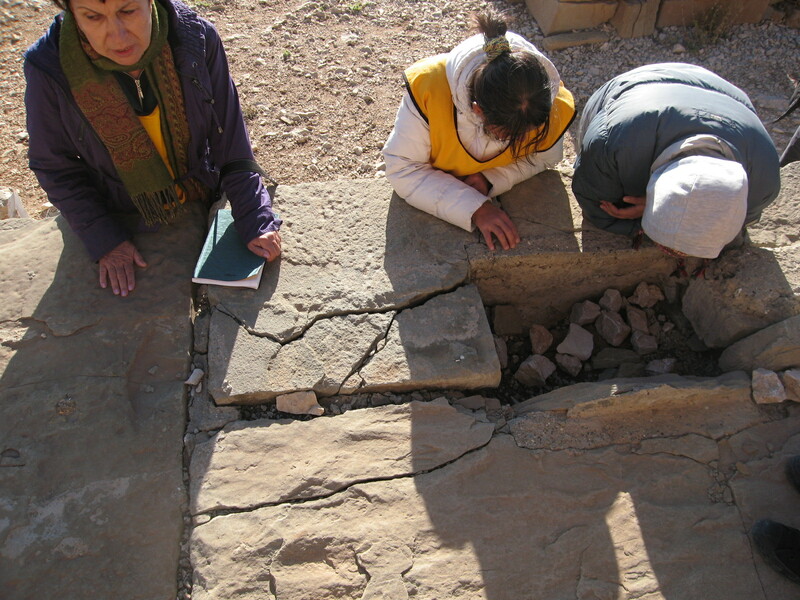 The team consisted of 24 people specialised in different subject areas: city planning (3), participatory planning (1), material deterioration research (7), historical and archaeological research (2), conservation and planning (9), geological research (2). 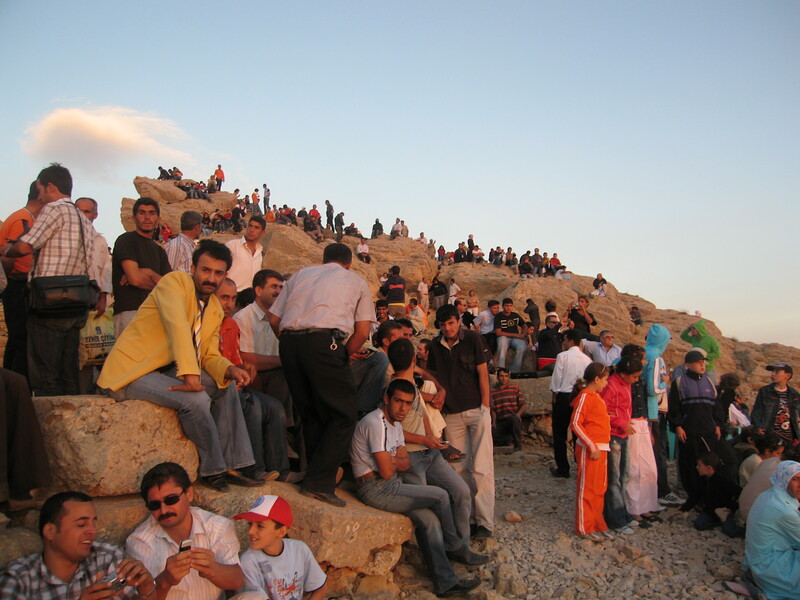 As a result, an inventory for 258 places/assets was formed, detailed research on the Tumulus of Mount Nemrut was carried out, measuring devices were positioned at particular spots around the tumulus, and meetings were organized with the local administration and stakeholders. 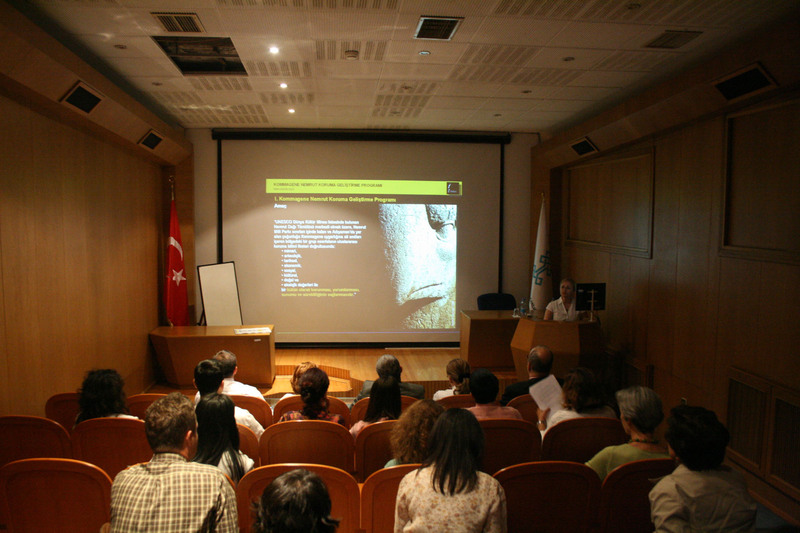 The Commagene Nemrut Conservation and Development Programme proposal, finalized after a 6-month research period, was presented to Ministry of Culture and Tourism by METU. 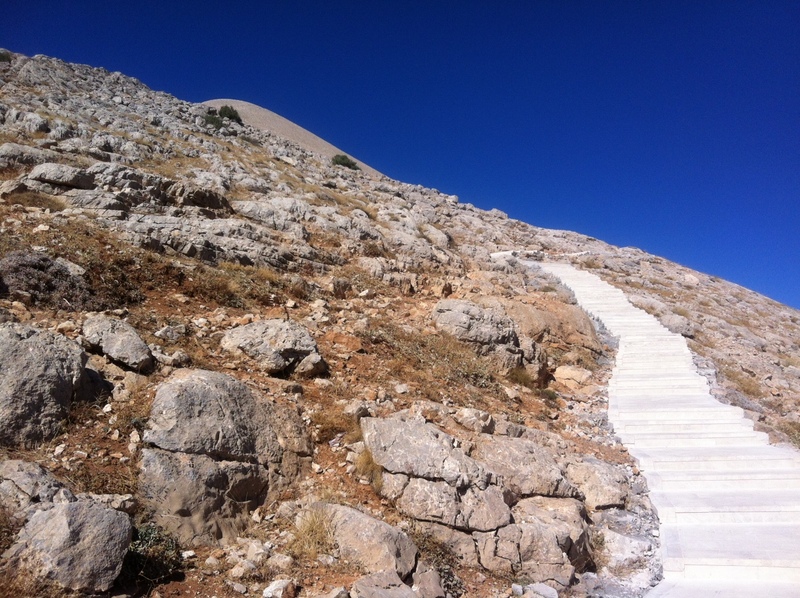 After a series of meetings with the authorities including Minister himself and the Mount Nemrut Scientific Advisory Committee, the proposal was approved. 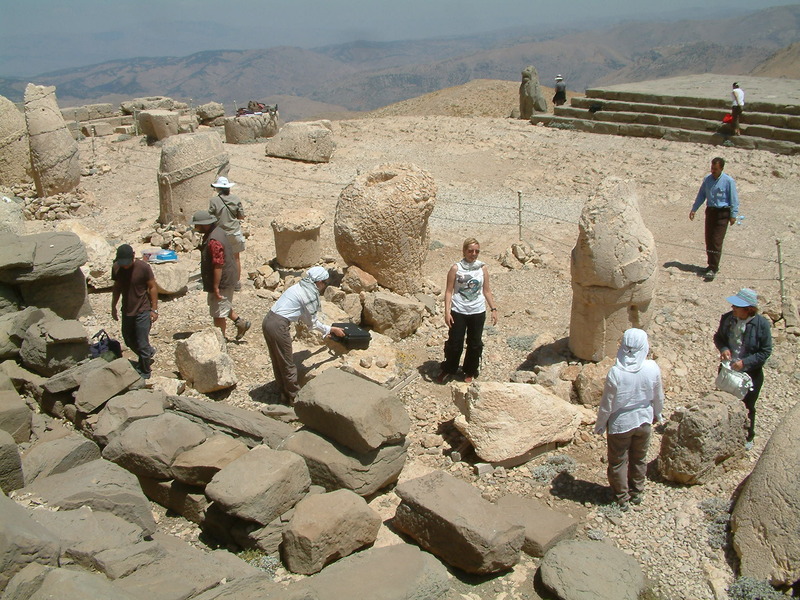 “Commagene Nemrut Conservation Development Programme – Protocol for the Development of a Management Plan for Commagene-Nemrut and Research on Mount Nemrut and its Tumulus and Monuments Material and Structural Condition, Geological Research and Conservation Recommendations” was signed on August 15, 2006. 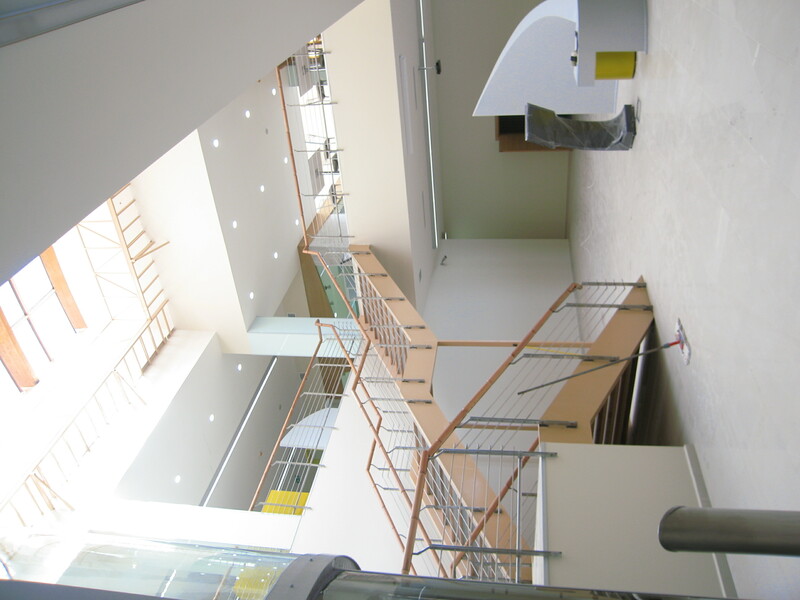 Work started immediately afterwards, with the formation of a team of 46 people from within the university and other universities as well as independent consultants.